© 2002, © 2018 by Paul Freeman. Revised 9/28/18. 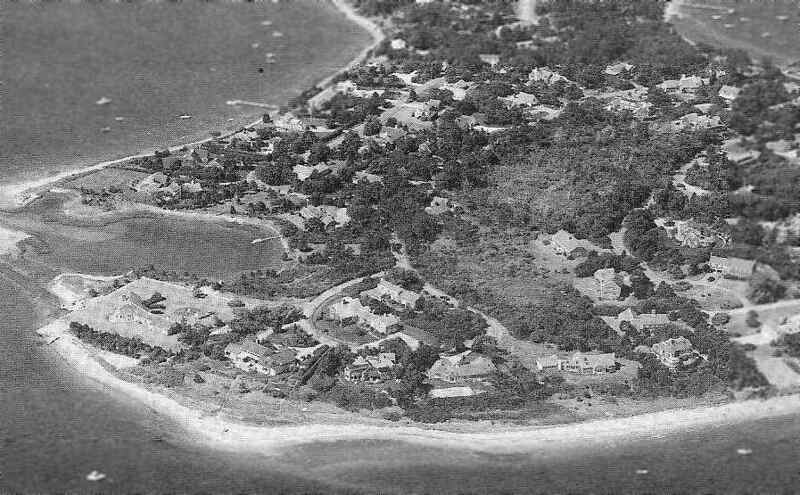 A 1955 aerial view (courtesy of Jack Grainger) showing Skymeadow Airfield at top-right, with Rock Harbor in the foreground. as it was not yet depicted on the 1946 USGS topo map. The earliest depiction which has been located of Skymeadow Airport was a 1955 aerial view (courtesy of Jack Grainger). Bill Quinn recalled flying out of Skymeadow Airport to take the first images of the collision of the MS Stockholm & passenger liner SS Andrea Doria in 1956. Charlene Ketchen Wallace, recalled, Sky Meadow Airport... My father Will Ketchen first ran this airport back in the 1950s. He & Doug Hoff were in partnership. My dad & mom ran the airport for several years. There was a dirt road which ran down the side of the runway towards the salt marsh. There was also a large hangar in our yard. The opening of the hangar faced the runway & the back was on our driveway. Skymeadow Airport was reportedly run by Hunter Craig, a former WW2 Marine Corsair pilot. 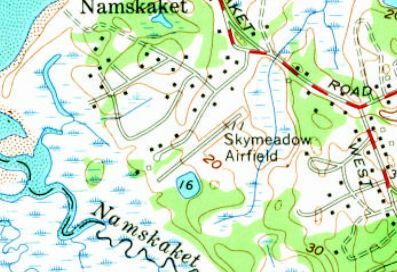 The earliest topo map depiction which has been located of Skymeadow Airport was a 1962 USGS topo map. It depicted Skymeadow Airfield as having a single paved northeast/southwest runway. 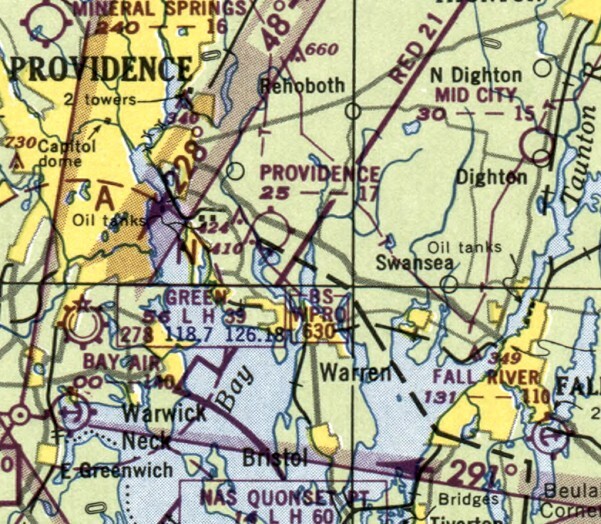 Skymeadow Airport was not depicted on the March 1965 Boston Sectional Chart. David Keith recalled, “Skymeadow Airport has a special place in my memory. 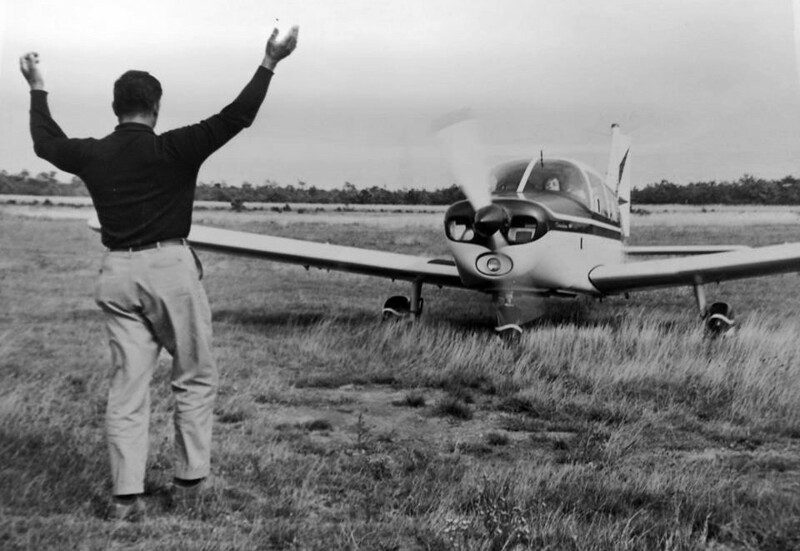 I took my Private Pilot checkride in the Brockton Flying Club Cessna 172, N3718S, at Skymeadow, on 4/14/67. Airport Manager Willard Ketchen, who had a craggy & imposing visage, was the check pilot. 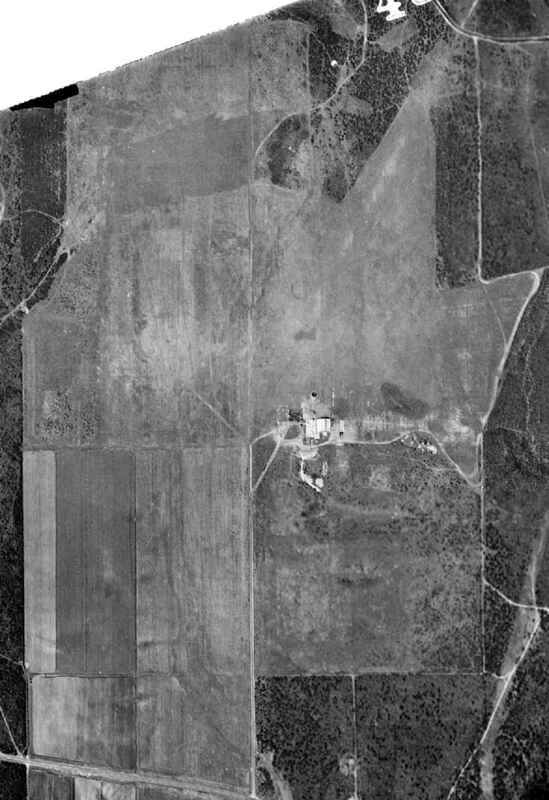 The earliest photo which has been located of Skymeadow Airport was a 1971 USGS aerial view. 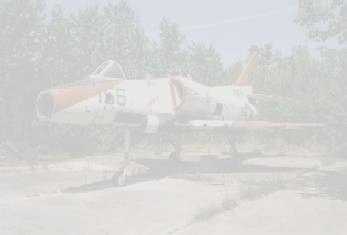 It depicted a single paved northeast/southwest runway, painted with 3 closed-runway “X” symbols & the word “Private”. with 4 light single-engine aircraft parked around the northeast hangar. 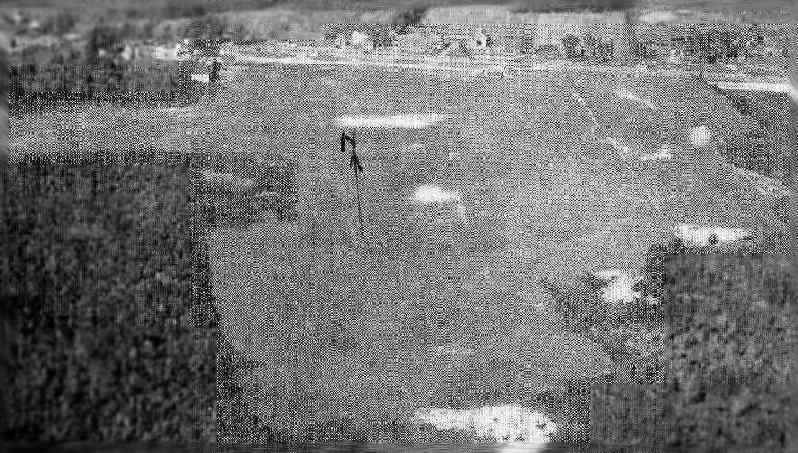 The earliest photo which is available of Skymeadow Airport was a 3/25/73 USGS aerial view. It depicted a single paved northeast/southwest runway, painted with 3 closed-runway “X” symbols. One hangar was located each at the northwest & northeast ends. Mark Clifton recalled, “Sky Meadow Airfield... an airport in Orleans that my father used to keep his plane at back in the 1970s. It was located near Skaket Beach (very close to the Captain Linnell House/restaurant) in Orleans. We would enter the airport off Captain Linnell Road. I recall as a child the field being in very poor shape (runway) along with a small hangar that was run-down. 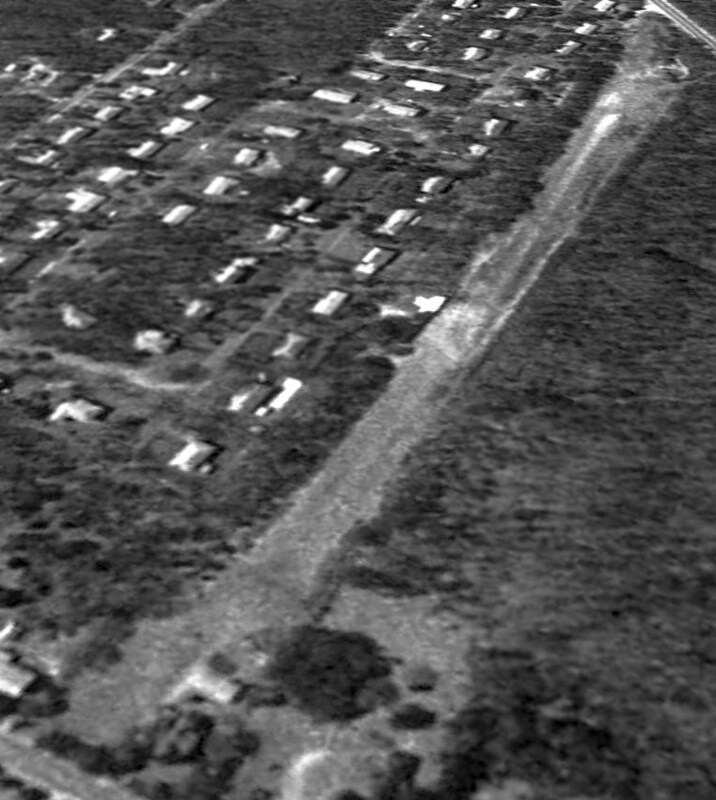 as a 4/1/77 aerial view showed 2 residential streets having been built, one over each end of the runway. A 3/23/82 aerial view showed that houses had covered the site of Skymeadow Airport, but the hangar on the northwest side of the runway remained intact. A 1984 aerial view looking north at the site of Skymeadow Airport (courtesy of Bernie Siryk) showed the alignment of the runway remained recognizable. 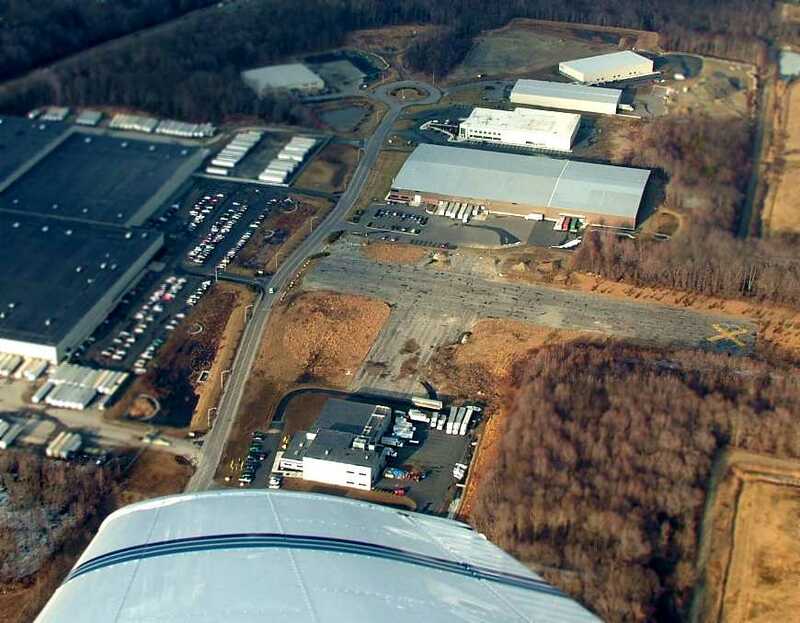 A 2015 aerial view showed no obvious sign of the former Skymeadow Airport, but the light-colored larger building on the west side is a former hangar. 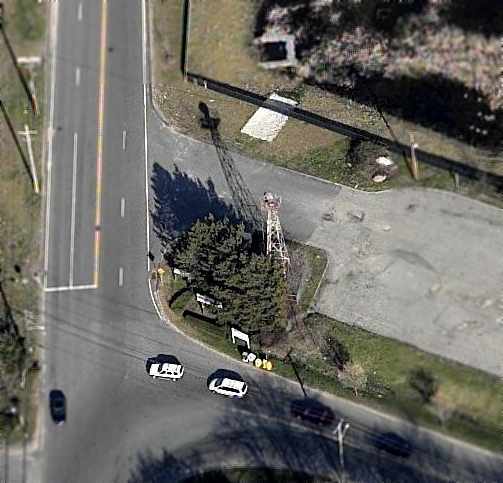 The site of Skymeadow Airport is located north of the intersection of Captain Linnell Road & Skymeadow Drive. Thanks to Bernie Siryk for pointing out this airfield. 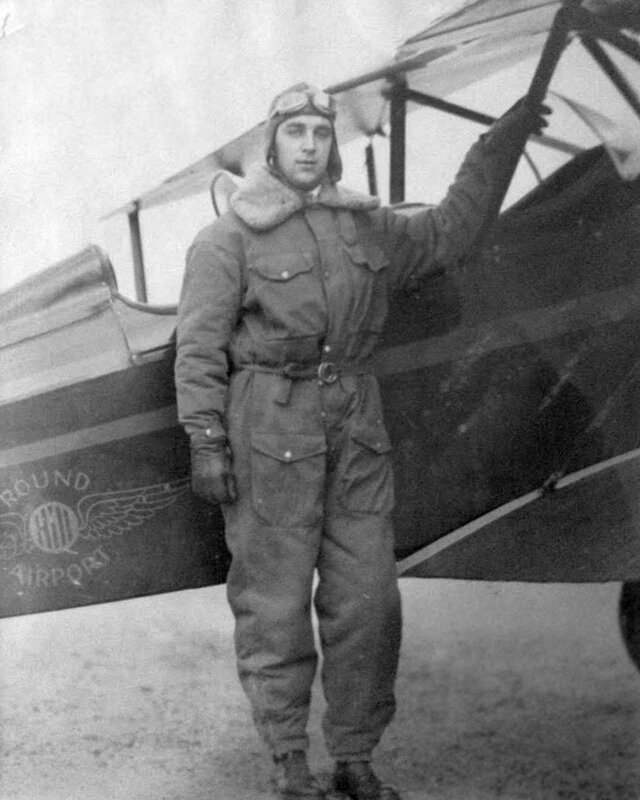 A circa late-1920s – 1932 photo of Phillip Mostrom in front of a biplane with the “Round Hill Airport” logo (courtesy of his gransdon Kurt Fischer). but also spurred Green's interest in aviation & the development of the airport. The airport was constructed one year later in 1928 & Hill became its manager & also ran a flight school there. As part of the construction, Green moved buildings & constructed a hangar to house airplanes. and sand pumped from Buzzards Bay to fill-in a natural saltwater marsh for his runways. Eddie Rickenbacker, Jimmy Doolittle and William Randolph Hearst Jr., all of whom landed there. a blimp, a seaplane ramp, several research buildings, a whaling village, a blacksmith shop. local residents saw it as a catalyst for economic development in the region. and were entertained with "a spectacular air show" by Lt. William Leonard, the chief test pilot for the Alliance Aircraft Corporation. Leonard performed an outside loop, a falling leap drop, a half roll & then circled the airfield upside down. was a circa late-1920s – 1932 photo of Phillip Mostrom in front of a biplane with the “Round Hill Airport” logo (courtesy of his grandson Kurt Fischer). An undated photo of two men in front of an unidentified biplane at Round Hill Airport. 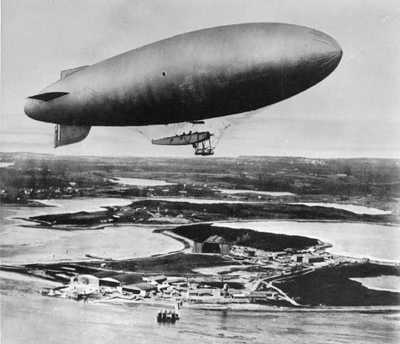 An undated photo of the Goodyear dirigible Mayflower, on loan to MIT, seen during testing to map the radiation patterns of various antenna arrays at Round Hill (courtesy of MIT Museum). In 1932 Lindbergh landed at Round Hill, after receiving word that his kidnapped son was hidden on a boat near the Elizabeth Islands. Lindbergh was accompanied by 3 passengers, including an FBI agent, but the tip about his son's whereabouts proved to be a hoax. The earliest aeronautical chart depiction which has been located of Round Hills Airport was on the March 1933 Boston Sectional Chart. It depicted Round Hill Airport as a private airfield with a beacon. Roberta Hill (Bert Hill's daughter) flew her solo flight from Round Hill at age 14 in 1936. She said "This airport put to shame even the military airports. 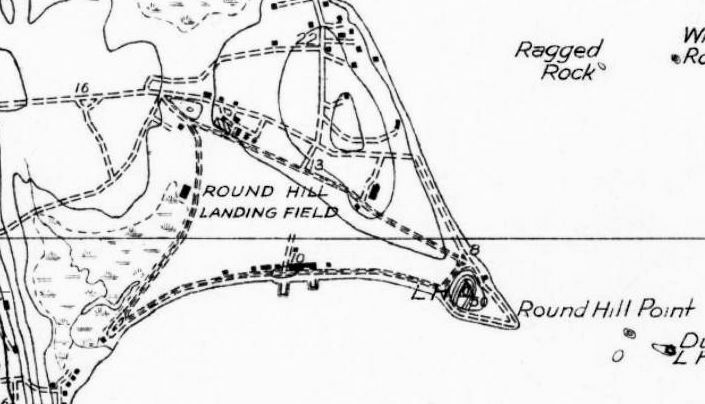 “Round Hill Landing Field”, as depicted on the 1936 USGS topo map. although it continued to be depicted on government maps for at least 6 more years. 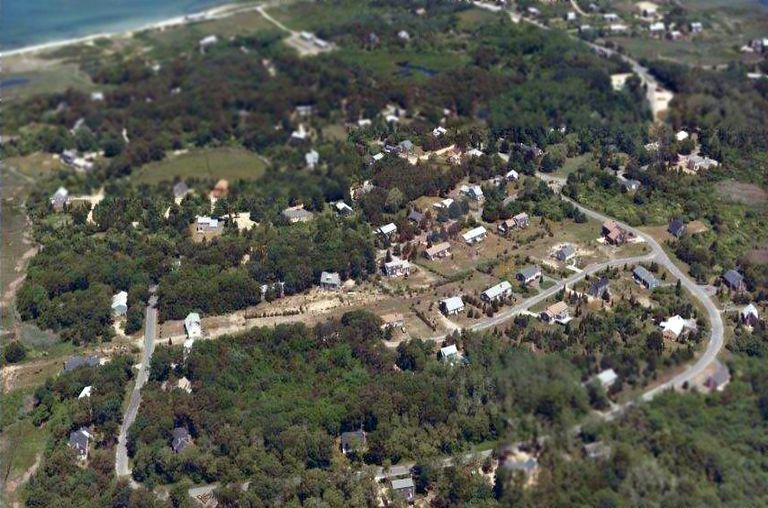 The Round Hill property was badly damaged in the 1938 Hurricane, which tore up the beach road & destroyed the hangar. 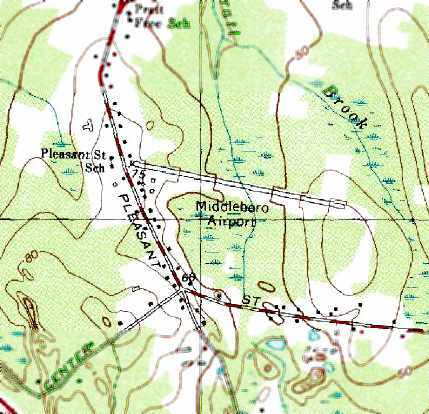 The last depiction which has been located of Round Hill Airport was on the 1942 USGS topo map. donated the entire property to the Massachusetts Institute of Technology (MIT), which used the 240-acre estate for educational & military purposes until 1964. MIT erected a giant antenna atop a 50,000-gallon water tank on the site. Another was erected nearby for research towards the Ballistic Missile Early Warning System. previously the site of Round Hill Airport. 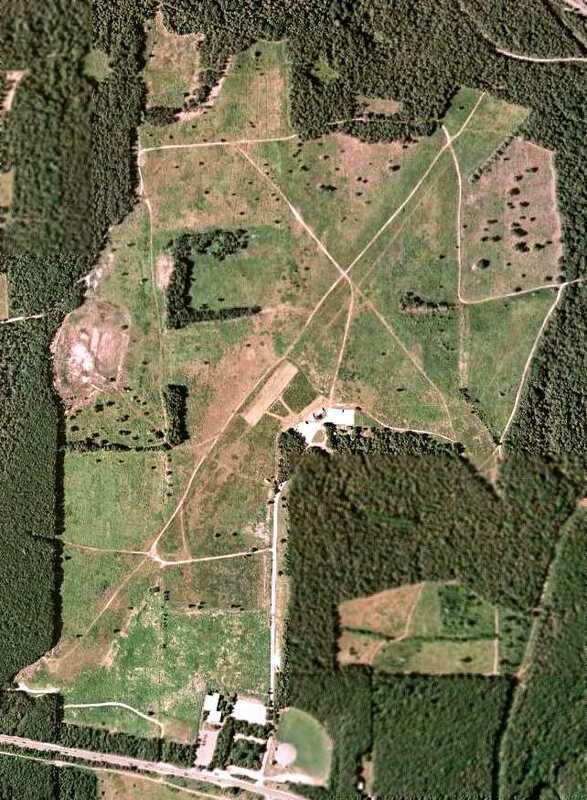 A 2013 aerial view showed the majority of the Round Hill Airport site remained clear. 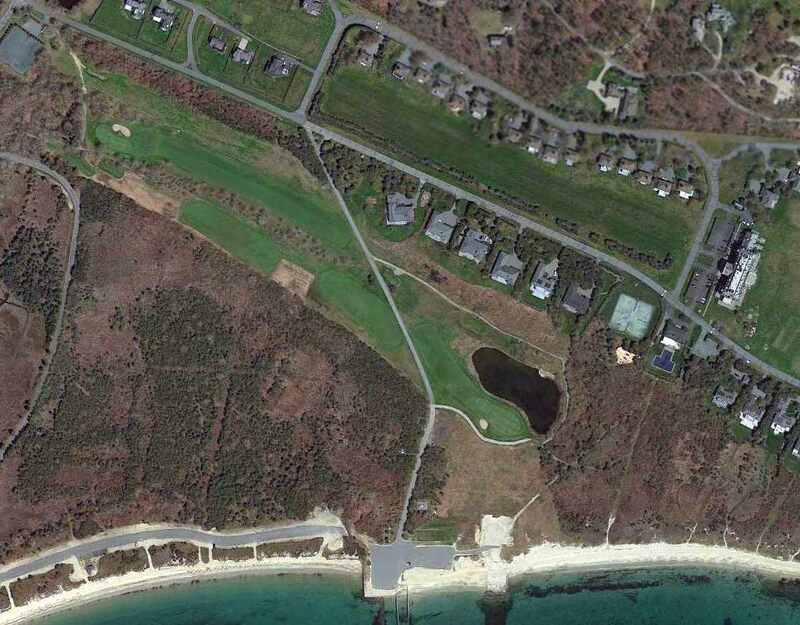 The site of Round Hill Airport is located south of the intersection of Round Hill Beach Drive & Club House Drive. 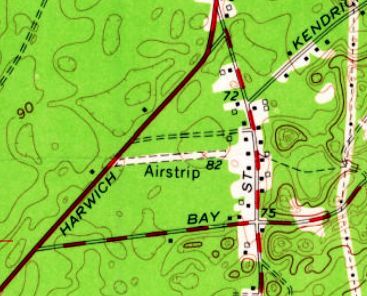 Cashen's Airfield was labeled simply as “Airstrip” on the 1961 USGS topo map. Cashen's Airfield was not yet depicted on the 1949 USGS topo map. John Nichols recalled, “There was a private airport in East Harwich in the 1950s. Jared Fulcher recalled, “The airstrip in East Harwich was owned by a man named Ralph Cashen & was known locally as 'Cashen's Airfield'. Stu Brennan recalled, “In the mid-1950s, I can remember my Uncle telling me there was a private airport just down the street from his house. However Paul Worcester reported, “This property has always been owned by the Bascom Family & still is today . which depicted a single east/west unpaved runway, labeled simply as “Airstrip”. 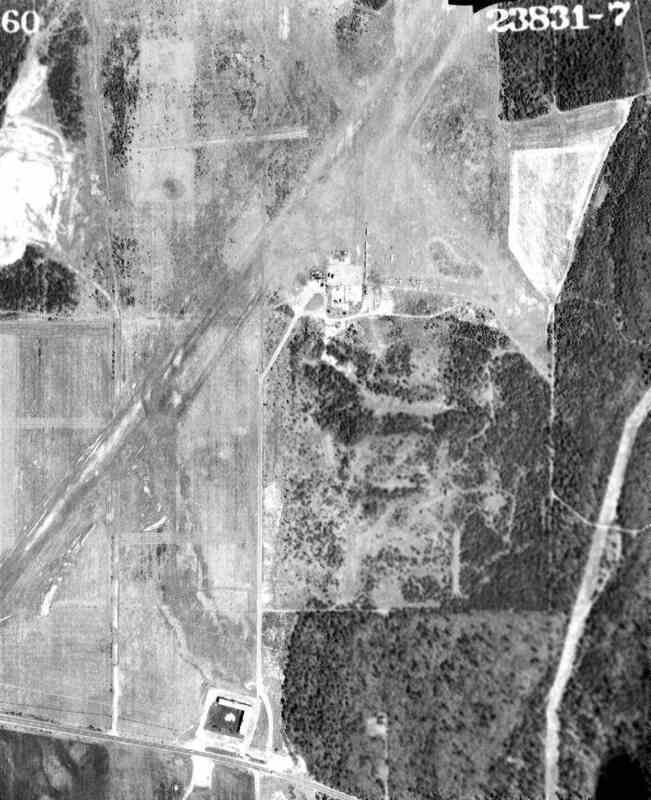 The only photo which has been located showing Cashen's Airfield while it was in operation was a 3/25/73 USGS aerial view. 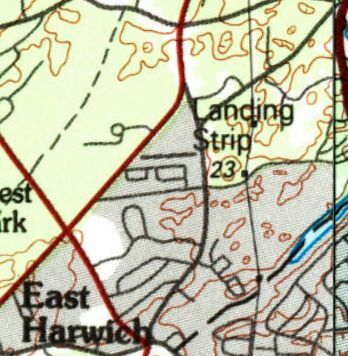 It depicted East Harwich Airport as having a single east/west unpaved runway, with some small hangars (& possibly some light aircraft) along the edges. A local resident reported, “The Cachen's Airfield was still being used in the mid-1990s by ultralight pilots. 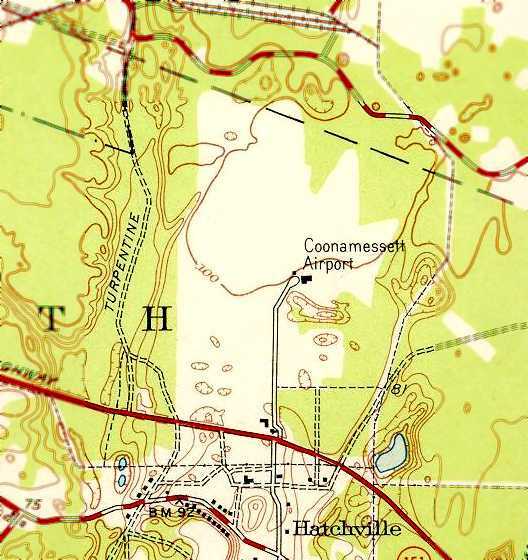 The 1994 USGS topo map still depicted Cashen's Airfield as having a single east/west runway. 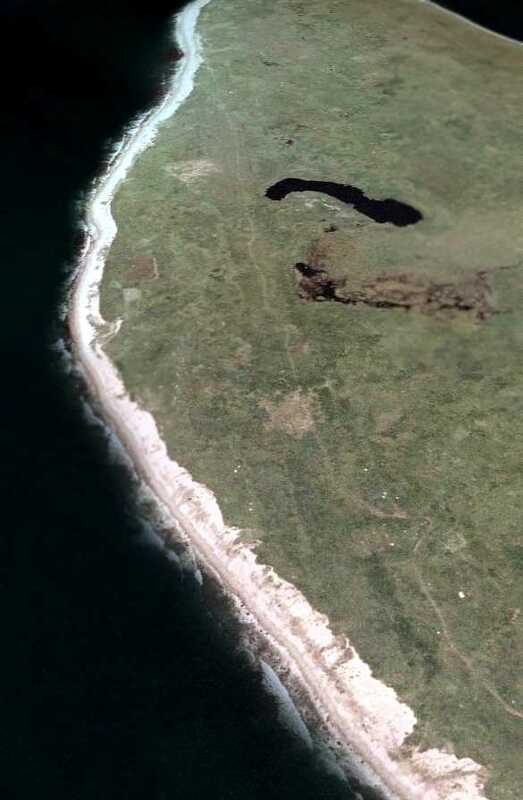 A 1995 USGS aerial view looking southwest at Cashen's Airfield showed the runway remained clear. A 2012 photo by Jaren Fulcher looking west along the remains of the Cashen's Airfield runway & the hangar along the south side. A 2012 photo by Jaren Fulcher looking southwest at the Cashen's Airfield hangar. 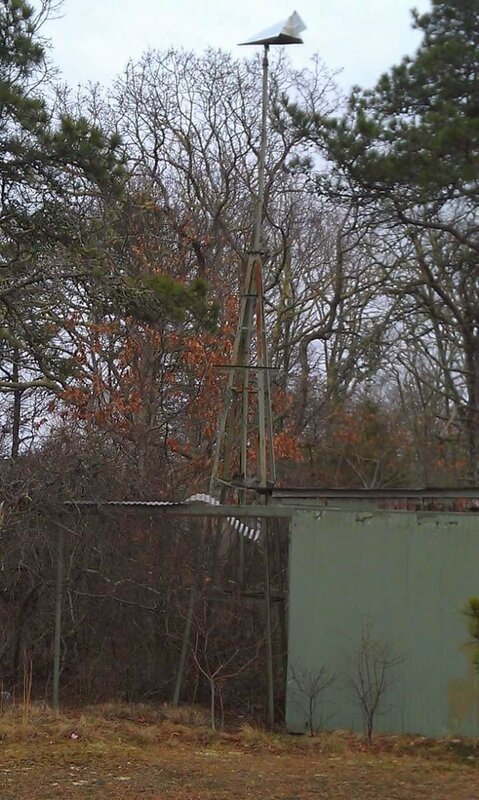 A 2012 photo by Jaren Fulcher looking west at the wind direction indicator mounted atop a tower behind the Cashen's Airfield hangar. and at least one small former hangar among the trees. Jared Fulcher reported in 2015, “Several years ago I went to an estate sale at a home accessed via a driveway parallel with Cashen's Field. I took this opportunity to cut through a path to the field. I was fortunate enough to traverse the field all the way to Route 39 at the far end. The ramshackle hangars & windsock still stand. I'm not sure if the property is still in the Cashen family, but I think it may be as it has never been developed. The field is still there, though slightly overgrown with scrub pines. 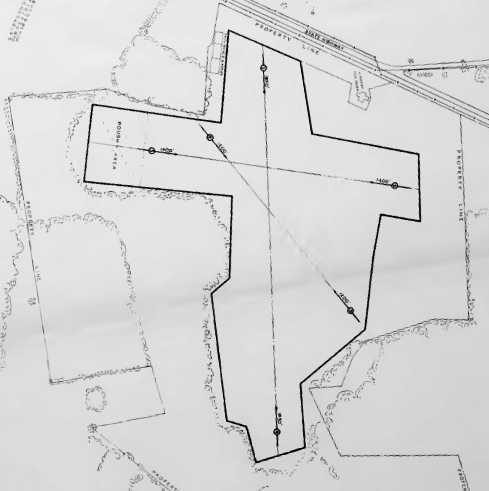 The site of Cashen's Airfield is located east of the intersection of Orleans-Harwich Road & Williamsburg Avenue. Thanks to John Nichols for pointing out this airfield. A circa 1940s photo of a Cessna T-50 & Republic SeaBee at Eastham Airport (from the 1869 Schoolhouse Museum in Eastham, courtesy of Joe Guzzo). including its date of construction or precise location. or the July 1946 Boston Sectional Chart. According to his obituary (courtesy of Kevin Rutherford), George Duffy managed the Eastham Airport after moving to Eastham in 1946. The airport was described as “little more than a grassy field off Herringbrook Road. which showed a Cessna T-50 & a Republic Seabee amphibian in front of a building (presumably the airport office) marked “Eastham” & “Fly”. touted charter, sightseeing, instruction, emergency service, and rental. According to FAA registration records, Cessna T-50 Bobcat N53207 was registered to Eastham Air Service from 1946-49. George Handel recalled, “A guy named Wally owned the T-50, and flew it regularly to Boston. He was killed in a traffic accident, and service to Boston then ceased. and he, along with several others, would shine their car lights on the runway for Wally to land. According to Joe Guzzo, Eastham Airport was also known as Brigg's Field. which depicted Eastham as having a mere 1,900' unpaved runway. 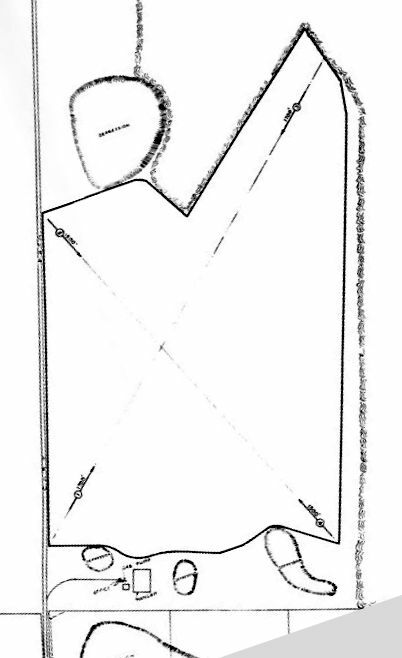 as that is how it was labeled on the January 1950 Boston Sectional Chart. as it was no longer depicted on the May 1953 Boston Sectional Chart. which depicted Eastham as a commercial/municipal airport. which depicted Eastham as having 2 unpaved northeast/southwest runways. 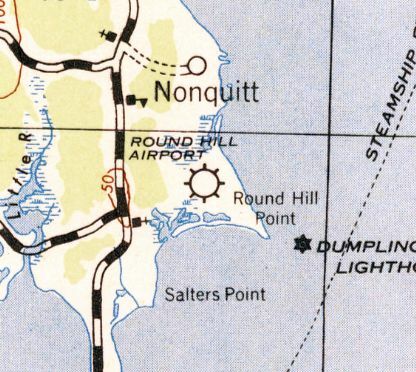 Eastham / Nauset Airport not depicted on the 1962 USGS topo map. 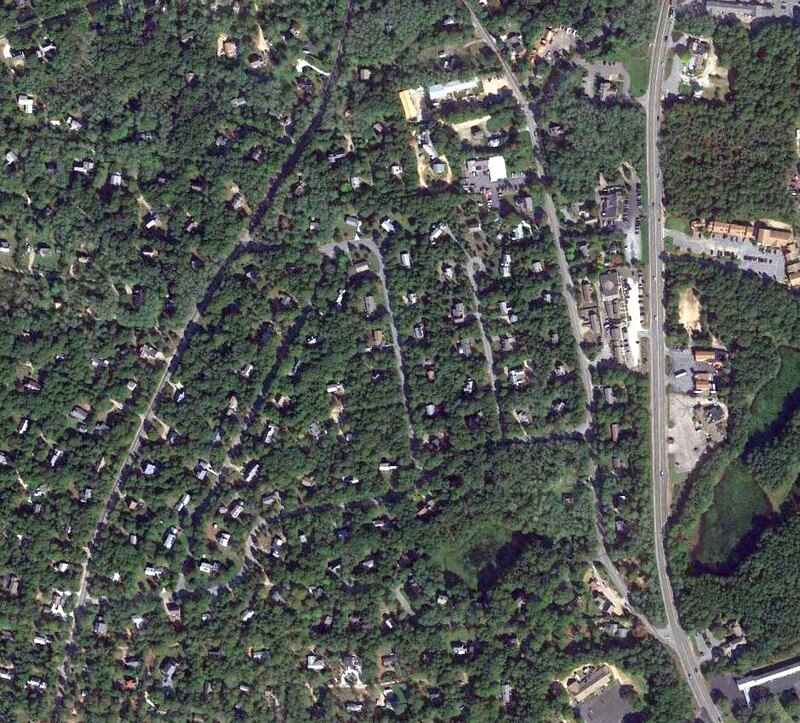 A 1996 USGS aerial photo showed houses covering the site of Eastham Airport, with no recognizable trace of an airport. 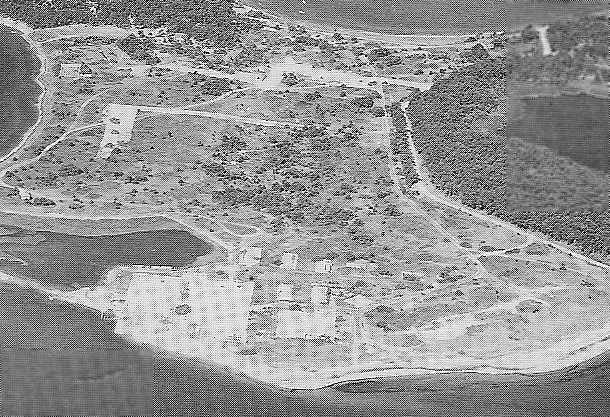 showing the houses which occupy the site, with no recognizable trace of an airport. The site of Eastham Airport is located on Runway Lane, appropriately enough. Clifton Field, as depicted on the May 1959 Boston Sectional Chart. as it was not yet depicted on the November 1958 Boston Sectional Chart. The earliest depiction which has been located of Clifton Field was on the May 1959 Boston Sectional Chart. It depicted “Clifton (Army)” as having a mere 1,600' unpaved runway. on land once used by the military called Camp Wellfleet. The airstrip was a 1,600' runway made out of sand & gravel that was originated & engineered by Don Clifton of Orleans. he was learning to fly at the time so he bulldozed a landing strip out in the woods near the Camp. The Army apparently knew it existed, but not quite what it was all about. A 5/1/60 USGS aerial view depicted Clifton Field as having a single unpaved east/west runway. attempts were made to get the first Superintendent (Robert Gibbs) to open the strip back up & pave it. 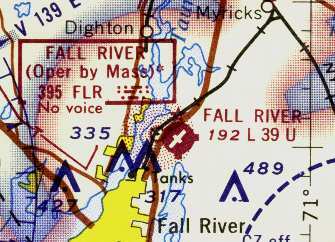 The last aeronautical chart depiction which has been located of Clifton Field was on the 1965 Boston Sectional Chart. It depicted “Clifton (Army)” as having a 1,600' unpaved runway. 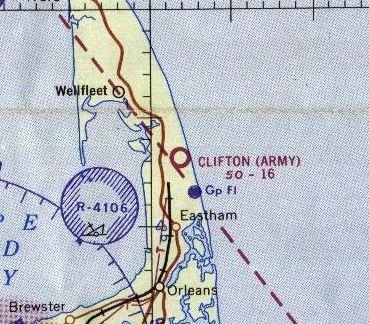 Clifton Field was no longer depicted on the March 1967 Boston Sectional Chart. 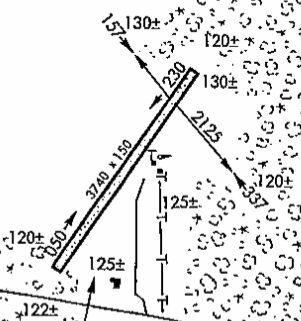 The 1972 USGS topo map depicted the rectangular clearing of the runway, but did not label the airfield. 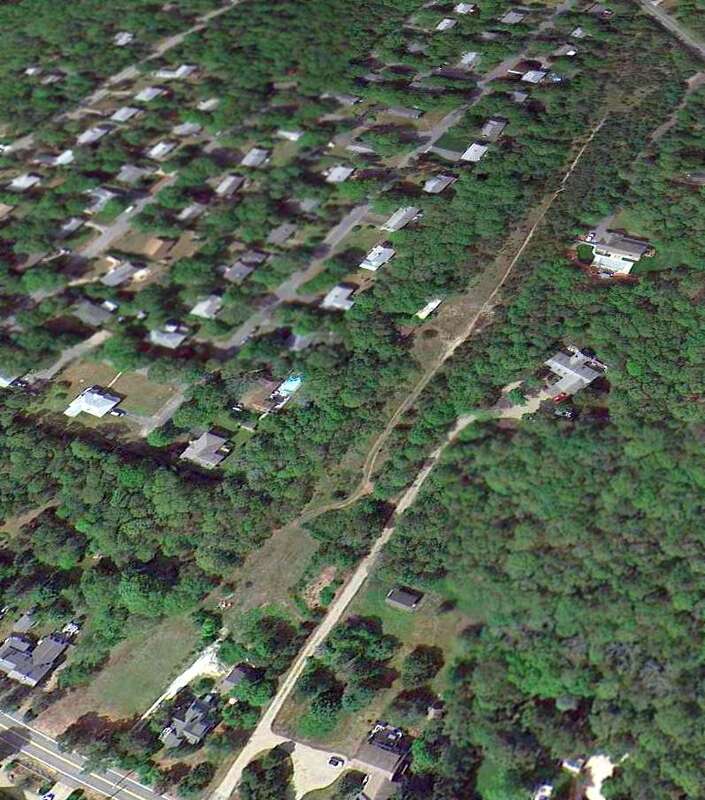 A 3/11/12 aerial view looking east showed the path of Clifton Field's runway is still recognizable through the surrounding trees. The site of Clifton Field is located at the southern terminus of Old Kings Highway. A Summer 1919 aerial view looking west at a Navy B-class airship flying over Chatham NAS. it became apparent to many that the United States would soon enter the war. As a result, the Department of the Navy planned 6 new Naval Air Stations on the East Coast. 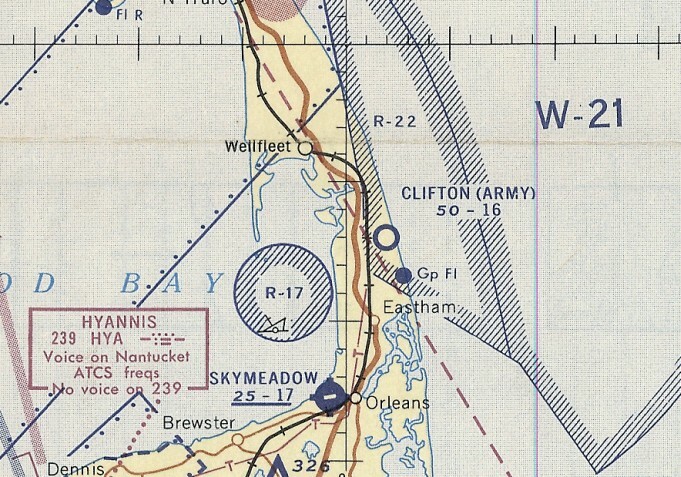 Chatham Naval Air Station was planned to occupy 36 acres on Nickerson Neck, next to Pleasant Bay. 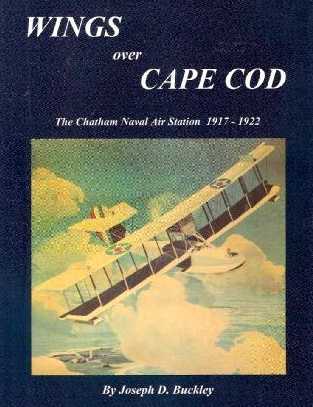 Before the United States even entered World War I, construction of Chatham Naval Air Station was beginning. hospital, pigeon loft, repair shops, garage & assorted storage & maintenance buildings. Pipes were laid in trenches & the nearest fresh water source was 3.5 miles away. By October 1917, the barracks & mess hall were ready for furniture & galley equipment. The resulting structures could handle about 100 men. That same month, the flag pole was placed & 3,000 people were in attendance for its first raising. In November, the United States entered the war. 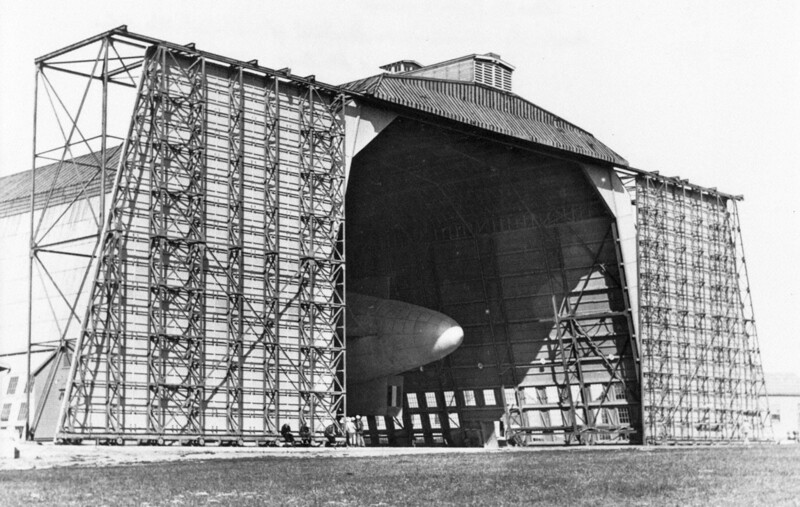 In December, the skeleton of the blimp hangar was finished & wooden slats were soon covering them. Concrete was then set to be poured for the hangar floors. This was complicated by the fact that it was one of the coldest winters that year. As a result, the concrete was poured & protected by tar paper & hot sand. The base was commissioned on 1/6/18. By then, many buildings were ready for occupancy & by mid-March, four Curtiss R-9s were delivered to the Chatham train station. They were assembled & the first flight was made by Lt. McKitterick on March 25. In July, 4 Curtiss HS-1L flying boats were delivered to the depot & trucked to the base. These aircraft were so urgently needed that they were put into service almost immediately. The addition of these aircraft increased the time available to patrols from dawn to dusk. Two patrol areas, aptly named Areas A & B were then created: Area A was to the north while Area B was to the south. Planes always went in pairs with one plane carrying a radio transmitter. The plane with the transmitter was required to radio in a location every 10 minutes. Both planes carried 2 homing pigeons for emergency communication with the base, and the birds had been trained for either the north patrol or the south patrol. Thus they could not be transferred from one area to another. Planes were equipped with emergency rations & water for 3 days, a flashlight, flare pistol with red & green cartridges, a sea anchor, life preservers, signal book & local charts. Patrols took place at 1,000' with the purpose to protect the shipping in a defined area. Often the planes would circle around a ship for hours while looking for U-Boats after picking up the vessel in a predetermined location. While the 2 planes were out on patrol, 2 other planes & their fliers were on standby at the station, ready to assist should a plane radio in a distress call. If the planes & men could get airborne within seven minutes, they were considered to be within the acceptable range of response time. Eventually blimps were used to help in the patrol process. With their cruising speed of 35 mph & a range of 900 miles, they were a useful asset in the patrols. The earliest dated photo which has been located of Chatham NAS was a Summer 1919 aerial view looking northwest at a Navy B-class airship overflying the station. One of highlight's of the station's service was when a report came in of the shelling of nearby Nauset Beach. Nine Curtiss HS-2Ls were dispatched to bomb the submarine that had already sunk 5 ships & was proceeding to start shelling Orleans. Either the resulting bombs were duds or they missed, and the U-boat got away. and the airship hangar at the top-left. An undated (circa 1918-20) photo of a Navy B-class airship flying over Chatham NAS (courtesy of Roger Pinel). A circa 1918-20 photo of a blimp (model unidentified) inside the Chatham blimp hangar (courtesy of the Atwood House Museum in Chatham). “With the war over the Naval Air Station became expendable. In May 1920 the station was preparing to be closed. 160 men were transferred to other bases while 10 were left behind to guard the property. including 3 HS flying boats which had been stored inside one of Chatham's hangars since 1920. “The Naval Department would purchase the base [in 1923] & in 1924 the process of removing the structures on the property began. 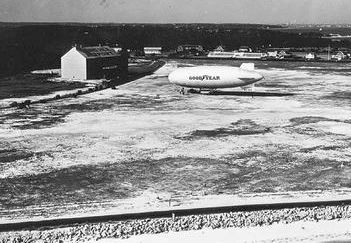 when the Goodyear blimps Defender & Mayflower operated from Chatham, as well as the commercial blimp Neponset. Chatham NAS was not depicted on the March 1933 Boston Sectional Chart. Chatham was removed from consideration for bases re-activated in the pre-WW2 buildup. 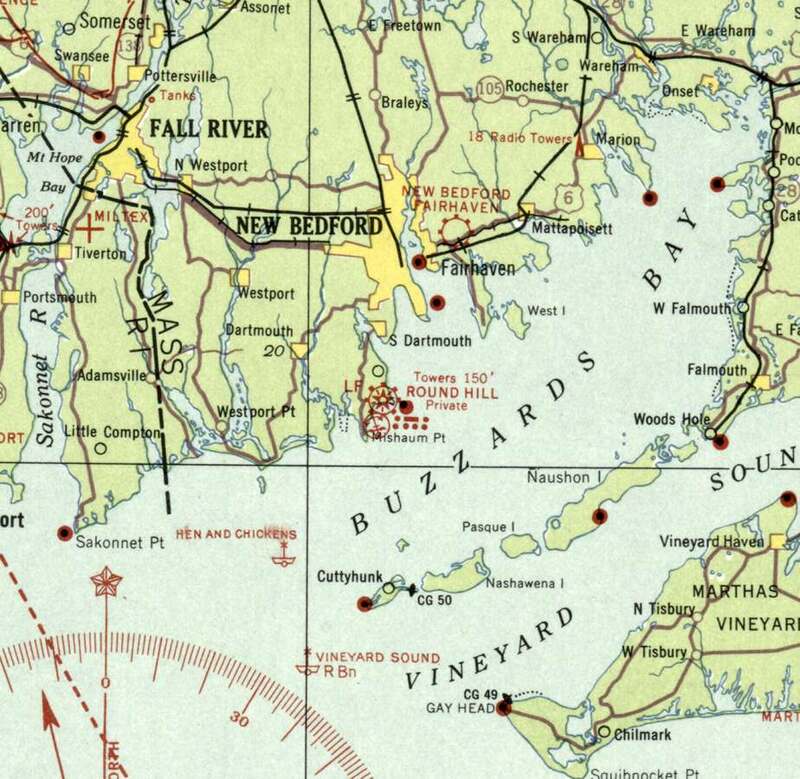 Nothing was depicted at the Chatham NAS site on the 1942 USGS topo map or subsequent topo maps. and to a contractor in 1956 who eventually covered the site with houses. as a circa 1950s aerial view looking west (courtesy of Roger Pinel) showed the site had been scraped clean, with only the ramps & foundations of the hangars remaining. Housing was built over the site of Chatham NAS at some point between the 1950s & 1979. 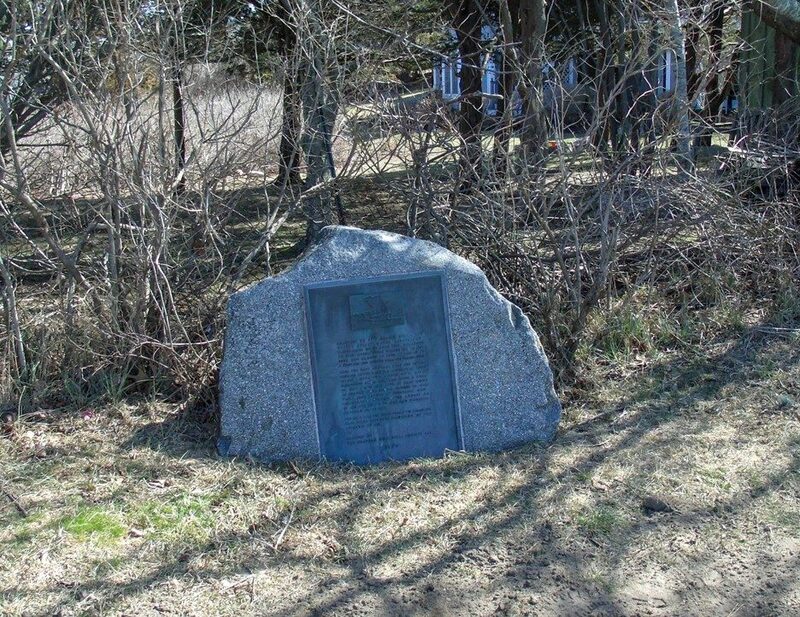 In 1979, a stone memorial was placed at the end of Strong Island Road to commemorate the NC-4 flight. In the 1980s, two PBYs retraced the famous flight that passed by the station. 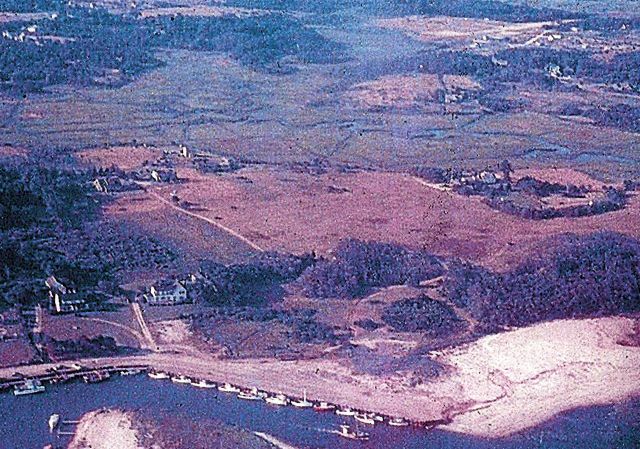 A 1995 USGS aerial view looking west showed a house had been built over Chatham's seaplane ramp, and other housing covered the remainder of the site. An August 2000 aerial view looking west (courtesy of Roger Pinel) showed Chatham's seaplane ramp remained recognizable (although with a house on top of it). 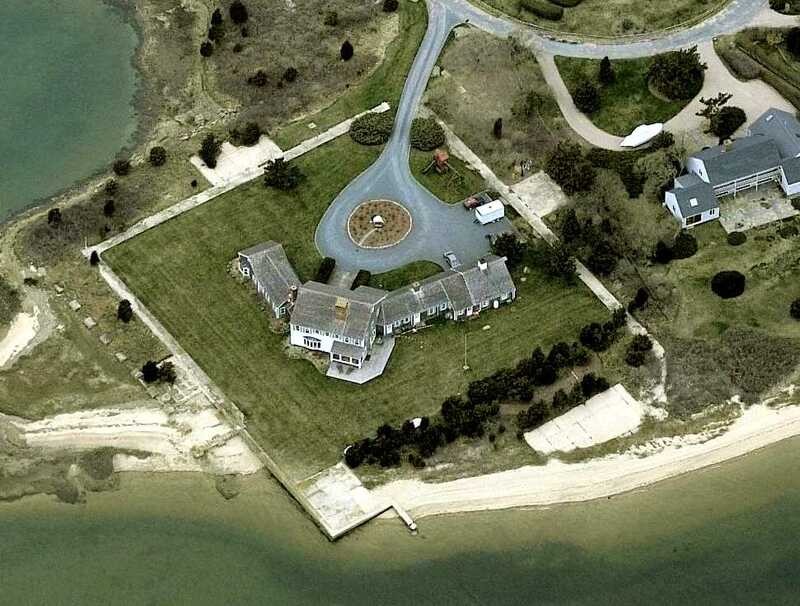 A circa 2010 aerial view looking west at the house built on top of Chatham's seaplane ramp. An undated photo from a 2017 of a historical marker commemorating Chatham NAS (courtesy of Thomas Page). An undated photo from a 2017 of concrete foundations which remain from Chatham NAS (courtesy of Thomas Page). The site of Chatham NAS is located at the eastern terminus of Eastward Road. 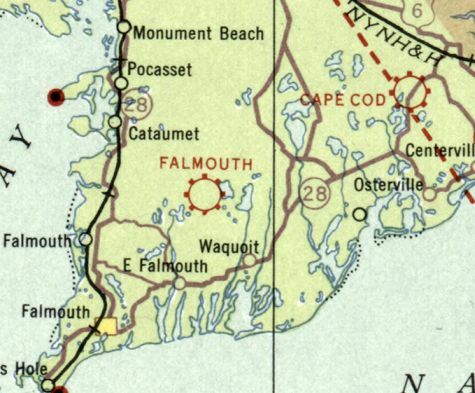 Falmouth Airport, as depicted on the March 1933 Boston Sectional Chart. This general aviation airport was located adjacent to the south side of Camp Edwards (later to be Otis AFB). 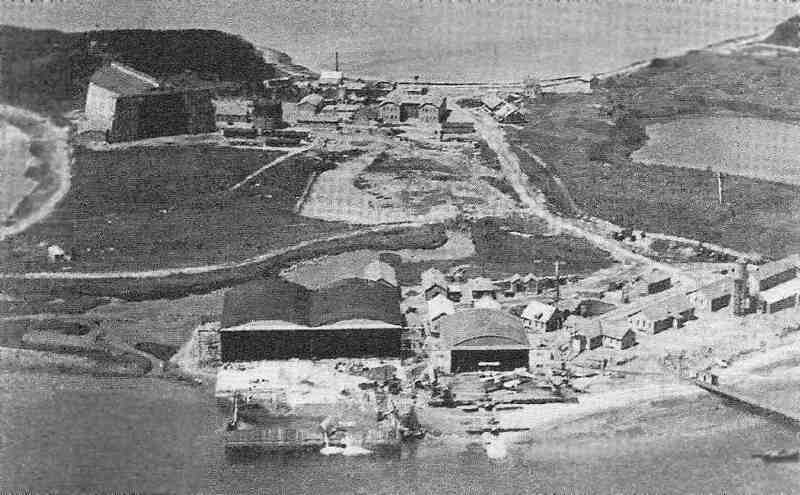 the Coonamessett Ranch Company developed the small Coonamessett Airport during 1928-29. It had a grass runway, fuel depot, and an office but no control tower. In addition, seaplanes could use Coonamessett Pond near the Coonamessett Inn. The Town of Falmouth leased the airport in 1930-31, and it grew steadily under the management of George Cluett & Guy Hamm. was in the 1931 Pilots' Handbook (courtesy of Jonathan Westerling). and having a 2,000' x 1,800' airfield area. including an 18-hole golf course, clubhouse, polo field, tennis courts, and riding stable. which depicted Falmouth as a commercial/municipal airport. 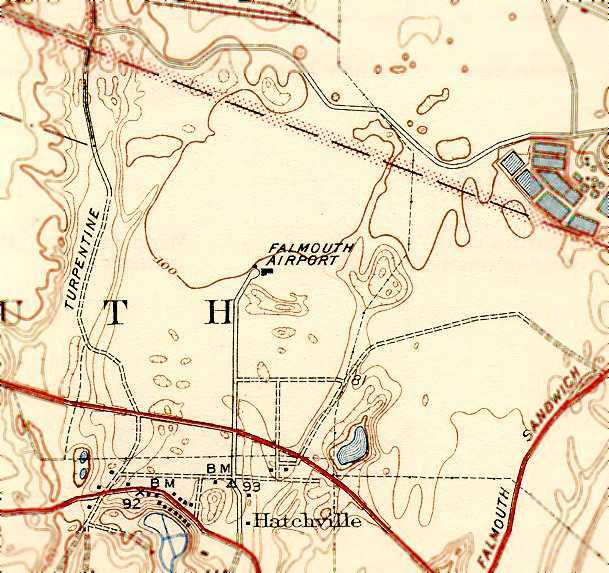 depicted Falmouth Airport as an irregularly-shaped property having unpaved runways in an X-shape, with 2 small buildings on the south edge. was a circa 1930s/40s view of a Stinson Reliant in front of the Coonamessett Airport hangars & office building. in improving the Coonamessett Airport for a municipal facility, the airport remained private. As part of the new war measures, civilian aviation up to 40 miles from the coastline was banned, and many small airports were closed. and training 24 student pilots when he learned that the airport would close on August 15. He relocated to another field farther inland. was on the 1943 USGS topo map (courtesy of Kevin Rutherford). 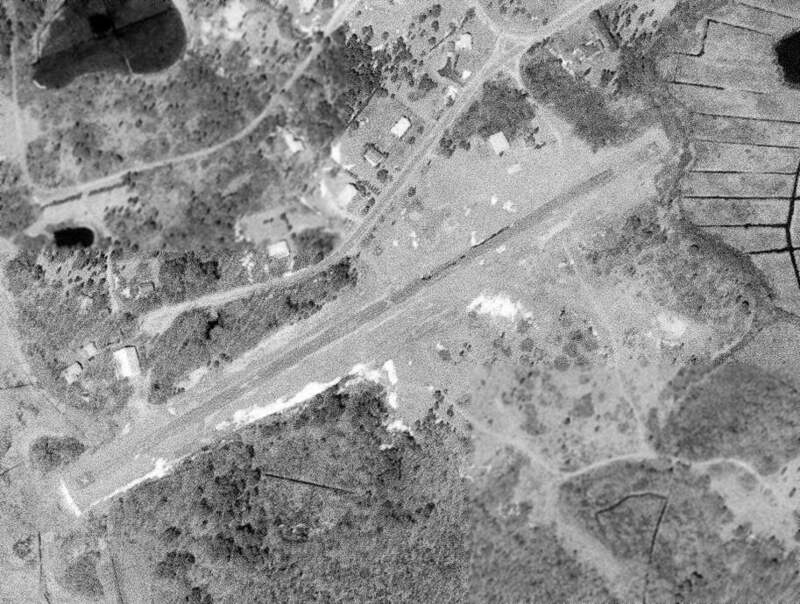 It depicted Falmouth Airport as having 2 small buildings in the middle of an open clearing. 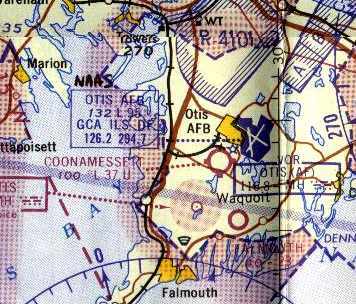 The 1945 Boston Sectional Chart (courtesy of John Voss) depicted Falmouth as an auxiliary airfield. However, Fallmouth was not listed among active airfields in the 1945 AAF Airfield Directory (courtesy of Scott Murdock). According to Les Garrick (author of “Historic Hatchville”), “After the war, the Coonamessett Airport became a political football. In 1946 it was leased for a year to Robert Kincart, to serve the needs of the Coonamessett Club, which meant restricted flying. However, much work would be required to obtain Civil Aeronautics Board approval for the field’s operation. and in July of 1946 moved to the new airport in Teaticket, a few miles to the east. Soon the Coonamessett Airport had new managers: George Pinto & Robert Draper. They started a flight training school in August 1947. At the time, the field was equipped for night use & planes could take off & land from any compass direction. with the predominant runway appearing to be northeast/southwest. near which were 2 light single-engine aircraft. as that is how it was depicted on the 1953 USGS topo map. It continued to depicted the field as 2 small buildings in the middle of an open clearing. 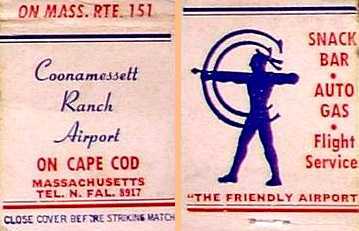 An undated matchbook from the “Coonamessett Ranch Airport”, proclaimed as “The Friendly Airport”. with strip lighting on the northeast/southwest runway only (the common wind direction). All instrument flights were under control of Otis Air Force Base. 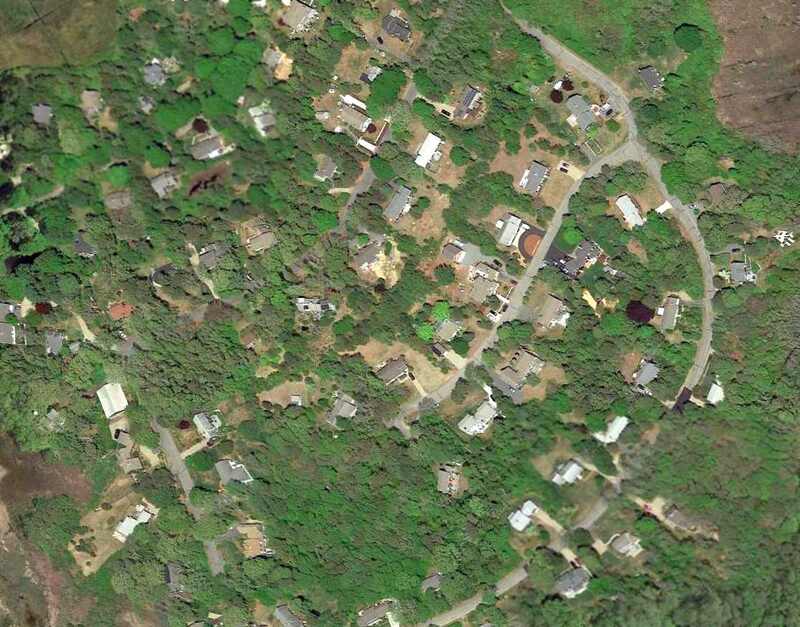 was a 1960 aerial view (from the Falmouth GIS system, courtesy of Kevin Rutherford). but what appears to be a baseball stadium had been built adjacent to the south entrance of the airport. A total of at least 9 light single-engine aircraft were visible on the ramp. guiding the National 99's Womans's Flying Club President Louise Smith's Piper into the Coonamessett Airport parking area. According to Les Garrick (author of “Historic Hatchville”), “Unfortunately for Mr. Pinto, the airport would not be compatible with wildlife management practices. Executive Air Services, Pinto’s company, was evicted on 6/1/61. 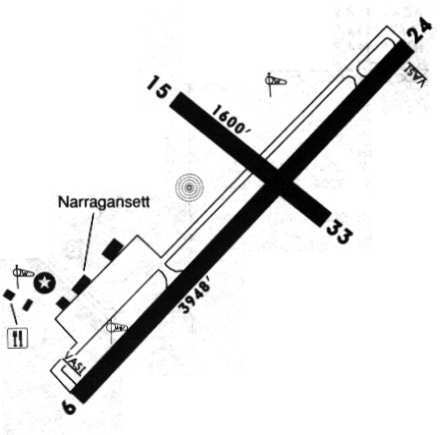 as the 1965 Boston Sectional Chart depicted Coonamessett Airport, with a 3,700' unpaved runway. 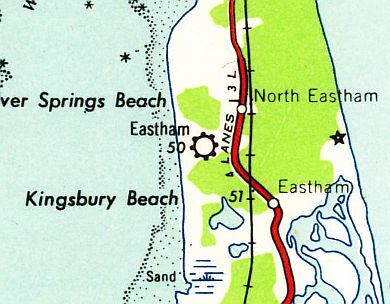 The last depiction which has been located showing Coonamessett as an active airport was in a 1967 Airport Directory (courtesy of Jonathan Westerling). with a few small buildings on the southeast side. The Coonamessett Airport was reportedly closed in 1968.
and the hangar had been removed at some point between 1960-68. The Coonamessett Airport was no longer listed among active airports in the 1976 AOPA Airports USA Directory (according to Jonathan Westerling). but the property was no longer labeled. The site of Coonemessett Airport was labeled “Crane State Wildlife Management Area” on the 1994 USGS topo map. along with a rectangular foundation of a former building (hangar?). 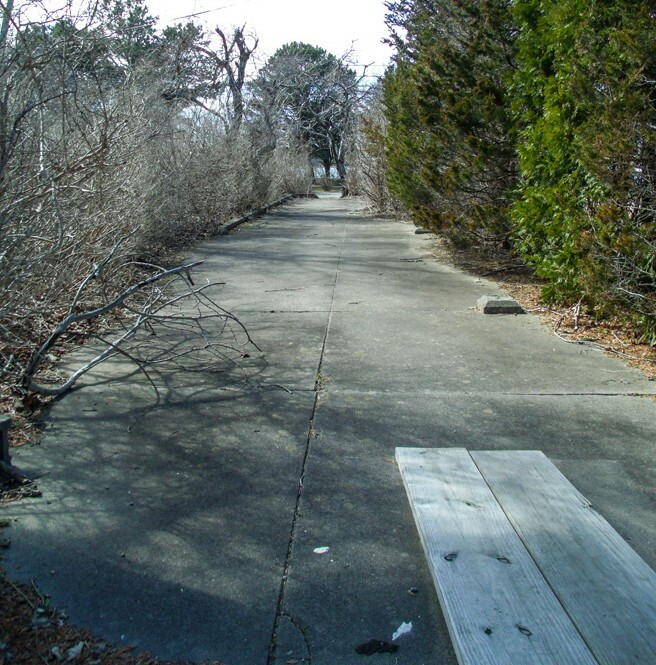 A 2007 photo by Les Garrick of the site of Coonamessett Airport, reused as the flying field for the Otis Model Aero Club Of Cape Cod. as well as a rectangular concrete foundation of at least one building just south of the runway intersection. The site of the Coonamessett Airport is located north of the intersection of Route 151 & Ranch Road. 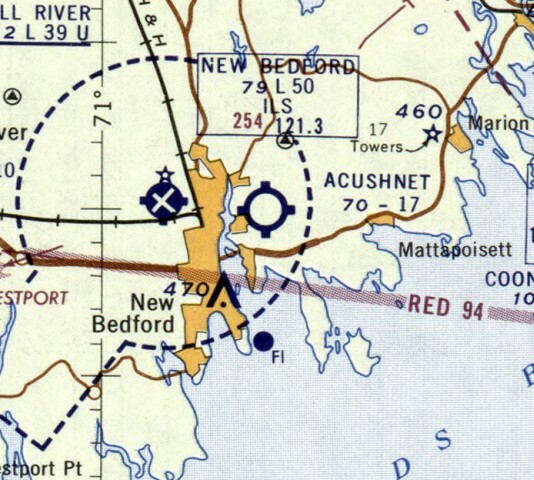 The Acushnet Airport, as depicted on the November 1958 Boston Sectional Chart. This short-lived little general aviation airport apparently lasted only 7 years or less. 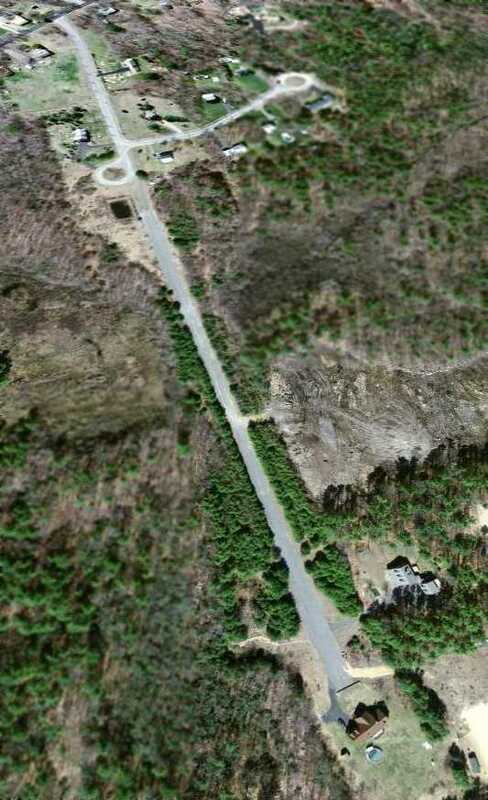 According to Pam Nault, the Acushnet Airport was “built, owned, and operated” by her father-in-law, Raymond Nault. 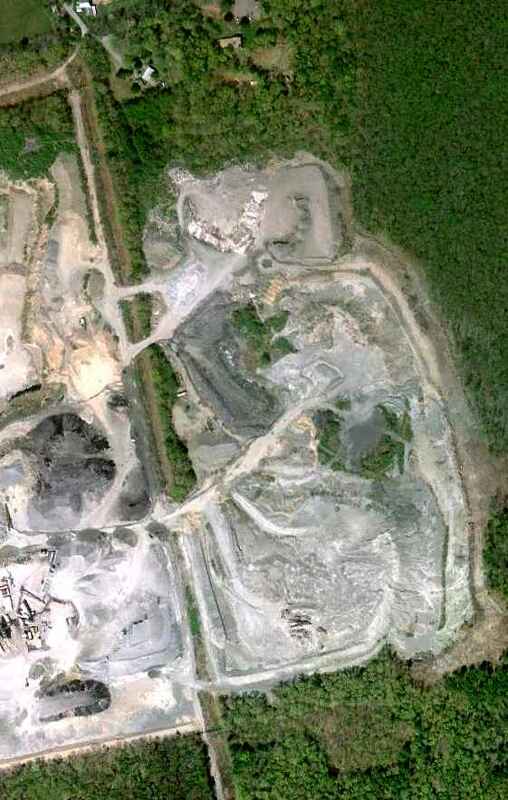 “It was cleared from the middle of a woods, near a blue stone quarry. nor on the 1958 USGS topo map. was on the November 1958 Boston Sectional Chart. It depicted Acushnet as having a mere 1,700' unpaved runway. 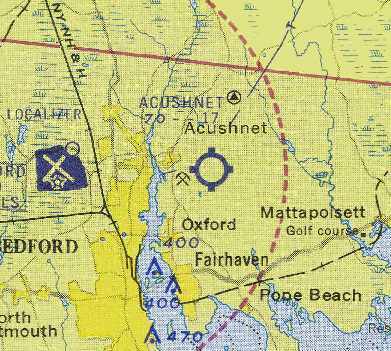 depicted Acushnet as a public-use airfield, having a 1,700' unpaved runway. 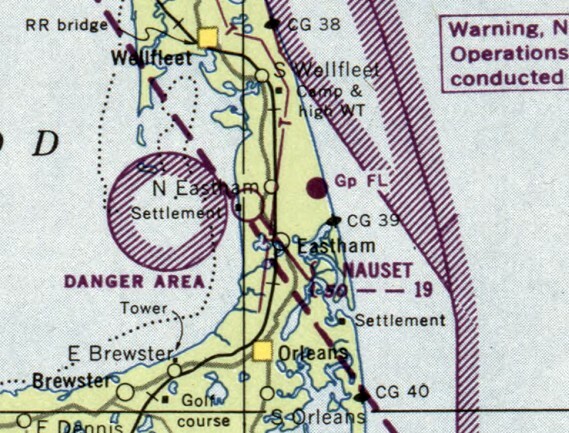 The Acushnet Airport was no longer depicted at all on the November 1960 Boston Sectional Chart. 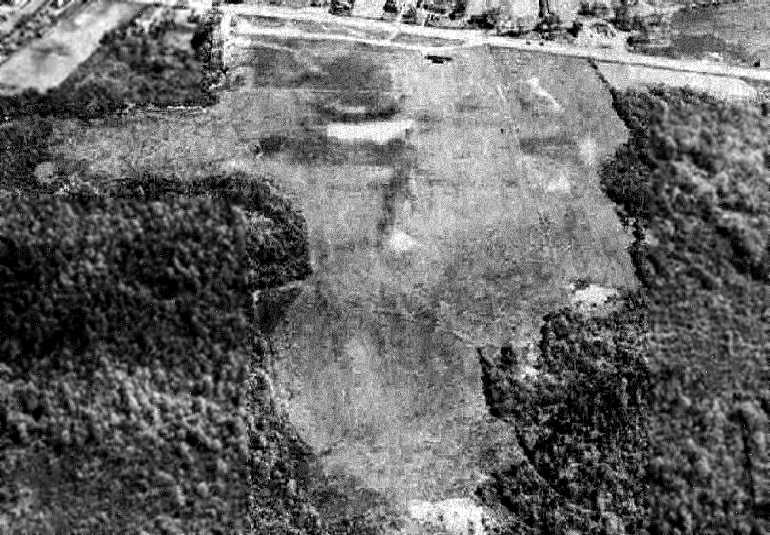 The earliest photo which has been located of the Acushnet Airport was a 1961 aerial view. It depicted Acushnet as having a single grass north/south runway, with one small hangar on the east side. 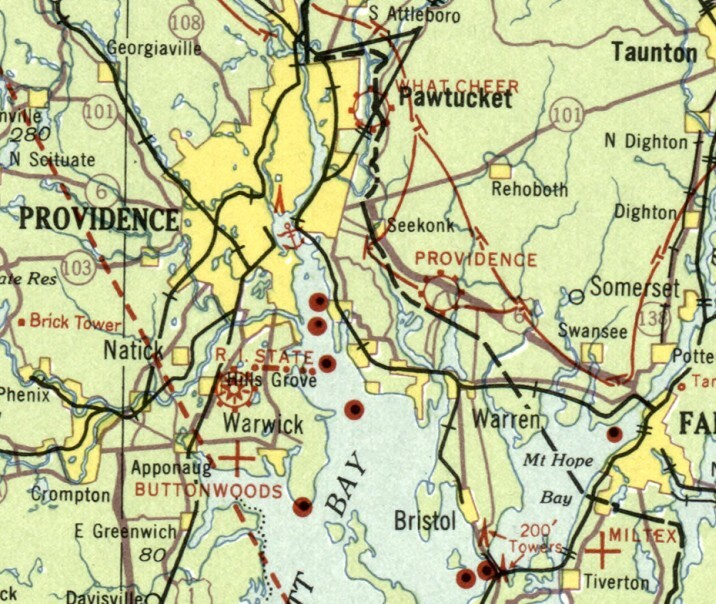 The Acushnet Airport was no longer depicted on the 1969 USGS topo map. A 1971 aerial photo showed Acushnet's runway remained clear, but the hangar had been removed at some point between 1961-71. 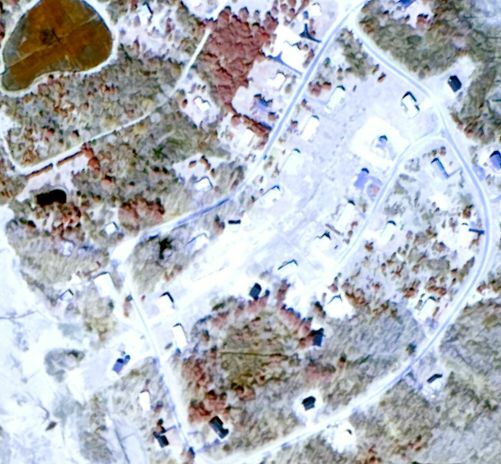 The 1995 USGS aerial photo showed the Acushnet runway area had been dug up for a gravel pit, leaving no trace of Acushnet Airport. 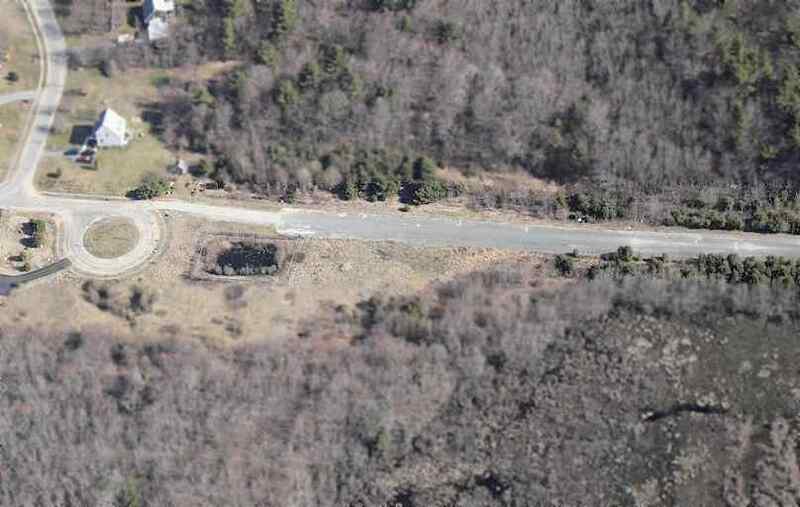 A 5/1/10 aerial view showed a gravel pit covering the site of Acushnet Airport. 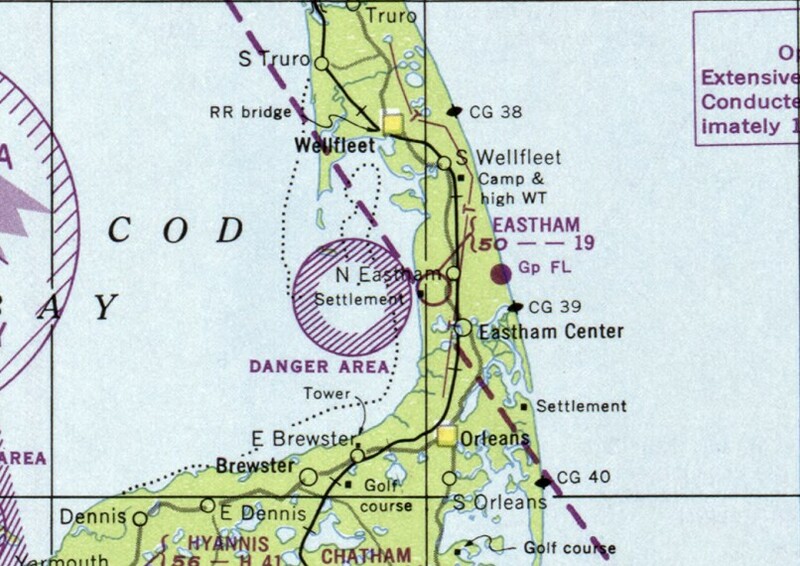 The site of the Acushnet Airport is located at the southern terminus of Wing Lane. was actually located just over the state line in Massachusetts. The date of construction of the original Providence Airport has not been determined. operated by "Providence - Fall River Air Trp., Inc.". The field was said to be 2,000' x 1,500' in size. The March 1933 Boston Sectional Chart depicted Providence as a commercial/municipal airport. on the 1934 Navy Aeronautical Chart (courtesy of Chris Kennedy). with a sod all-way landing area, with the longest distance being 1,400' east/west. The field was said to have 2 hangars, the largest being a 90' x 40' steel structure. from The Airport Directory Company's 1938 Airports Directory (courtesy of Chris Kennedy). 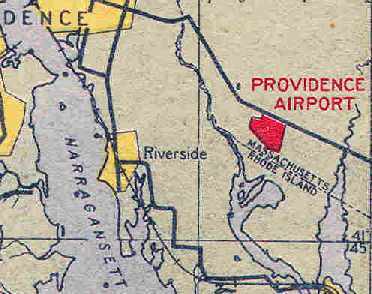 The directory described Providence as a commercial airport, located 6.5 miles southeast of Providence. 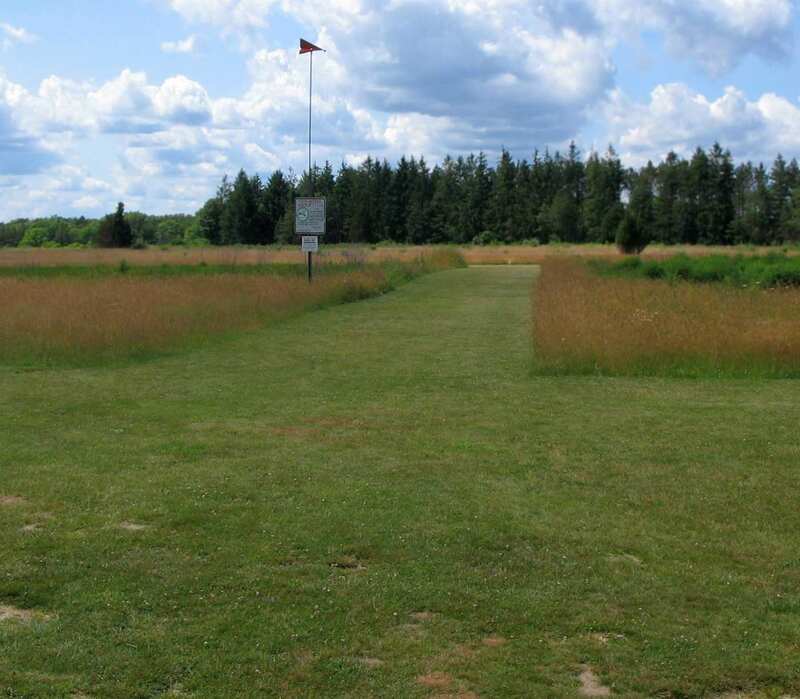 It was said to consist of an irregularly shaped sod field, measuring 1,900' north/south x 1,500' east/west. which was said to have "Providence Airport" painted on the roof. and several planes on the field (according to Chris Kennedy). as a 103 acre irregularly-shaped field with an all-way sod landing area measuring 1,650' NNE/SSE by 1,300' east/west. Two hangars were depicted on the north side of the field, measuring 60' x 40' & 46' x 34'. The field was described as privately owned & operated. It depicted Providence as having a mere 1,700' unpaved runway. The 1951 USGS topo map (courtesy of Chris Kennedy) labeled the site simply as "Airport". with the single hangar & a few smaller buildings along the north side of the field. and 2 single-engine light planes were visible on the northwest side of the field. as it was no longer depicted at all on the November 1954 Boston Sectional Chart (according to Chris Kennedy). 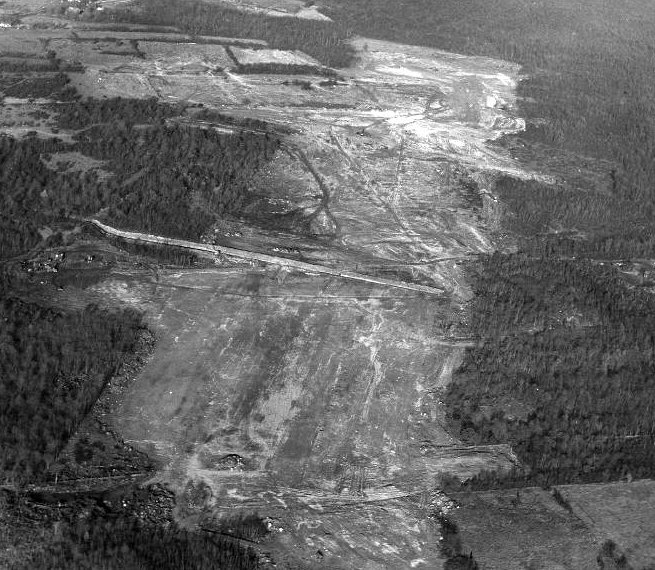 A 1963 aerial view showed that the site of the former airport remained clear, but abandoned. 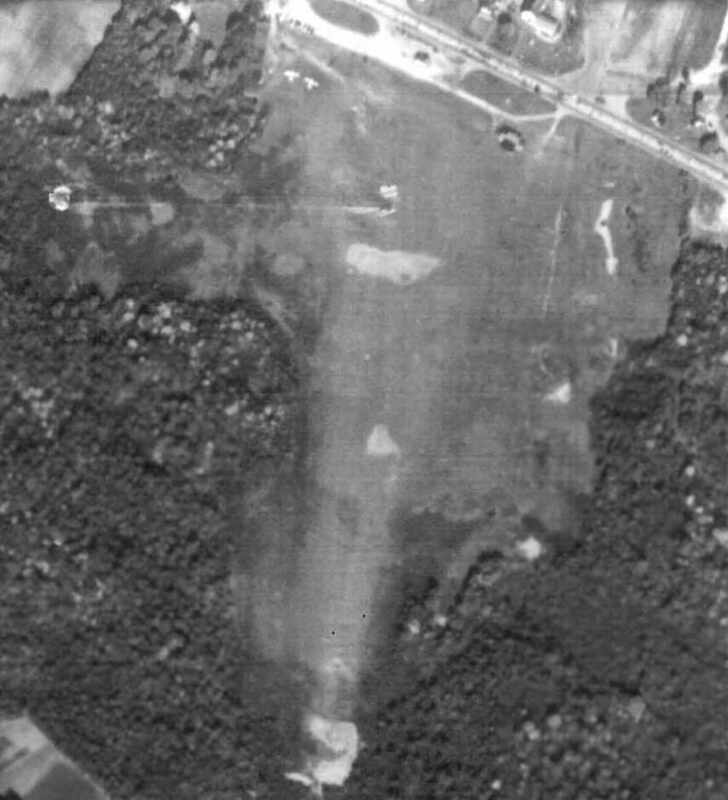 As seen in the 2002 USGS aerial photo, not a trace remains of the original Providence Airport. of the intersection of Route 6 & Industrial Way. 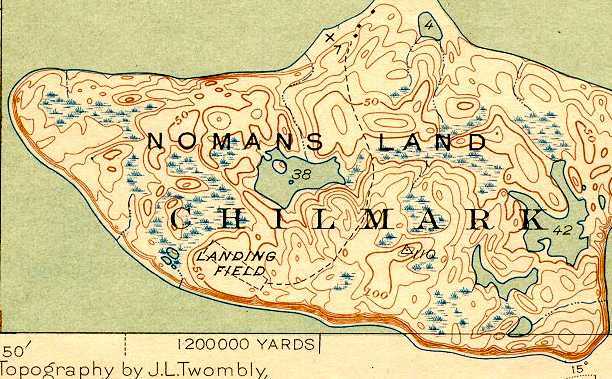 The No Man's Land Airfield, as depicted on the 1943 USGS topo map (courtesy of Kevin Rutherford). 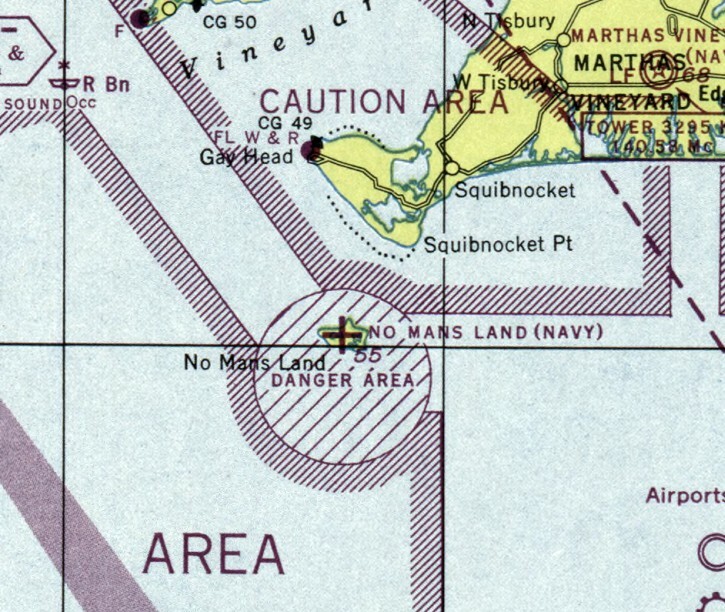 No Man's Land is a small, uninhabited island located 3 miles southwest of the southwest tip of Martha's Vineyard. as it was not depicted on the November 1942 Regional Aeronautical Chart (according to Chris Kennedy). at which point the airfield was most likely constructed. 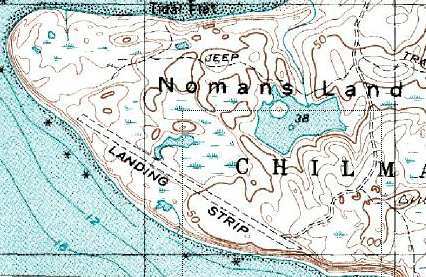 The earliest depiction of the No Man's Land Airfield which has been located was on the 1943 USGS topo map. It depicted a single northwest/southeast unpaved “Landing Field” on the southwest side of the island. 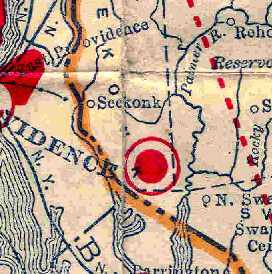 was on the November 1944 Boston Sectional Chart. It depicted “No Mans Land (Navy)” as an auxiliary airfield. was on the June 1945 Boston Sectional Chart (courtesy of Ron Plante). However, No Mans Land was not listed among active airfields in the 1945 AAF Airfield Directory (courtesy of Scott Murdock). It is not known if the airfield merely served as a bombing target, or if it was actually used by Navy aircraft. as it was no longer depicted on the July 1946 Boston Sectional Chart. 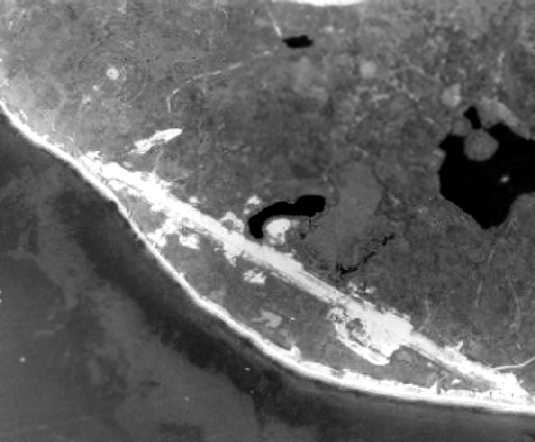 A 1971 U of M photo of No Man's Land Island, with the airfield still plainly visible along the southwest shore. Also note the bomb target circle just northwest of the runway. The Navy continued to use No Man's Land island for bombing practice until 1996. It was also used for radar-scored bomb practice by B-52 bombers. for use as an unstaffed wildlife refuge. 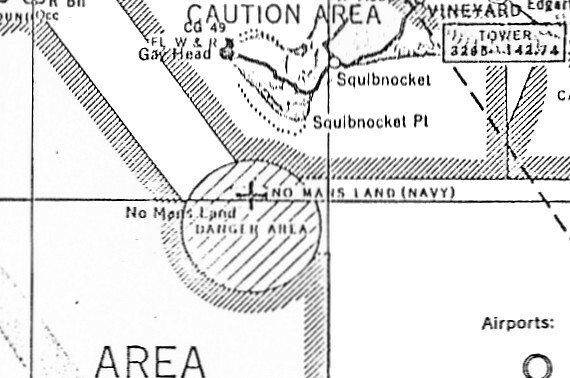 As depicted on the 1989 USGS topo map, the No Man's Land Airfield consisted of a single 3,300' runway. There were no indications of any buildings or other airfield facilities. The 1989 topo map includes the notations: "Military Reservation. Restricted Area. US Navy Air to Ground target. Ordnance expenditure authorized 7 days a week." 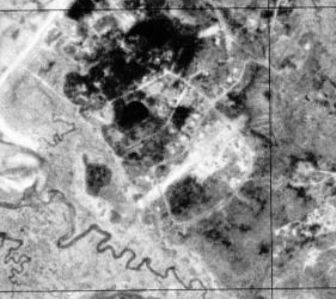 By the time of the 1995 USGS aerial photo, the former No Mans Land Airfield was hardly recognizable at all. In a 2007 aerial view looking northwest along the path of the former No Mans Land Airfield runway, showing it to be barely recognizable. 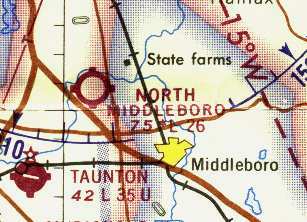 North Middleboro, as depicted on the 1959 Boston Local Aeronautical Chart (courtesy of Chris Kennedy). Photo of the airfield while open is not available. nor on the 1957 USGS topo map. was on the 1959 Boston Local Aeronautical Chart (courtesy of Chris Kennedy). It depicted North Middleboro as having a 3,000' unpaved runway. with several small buildings along the west end of the runway. 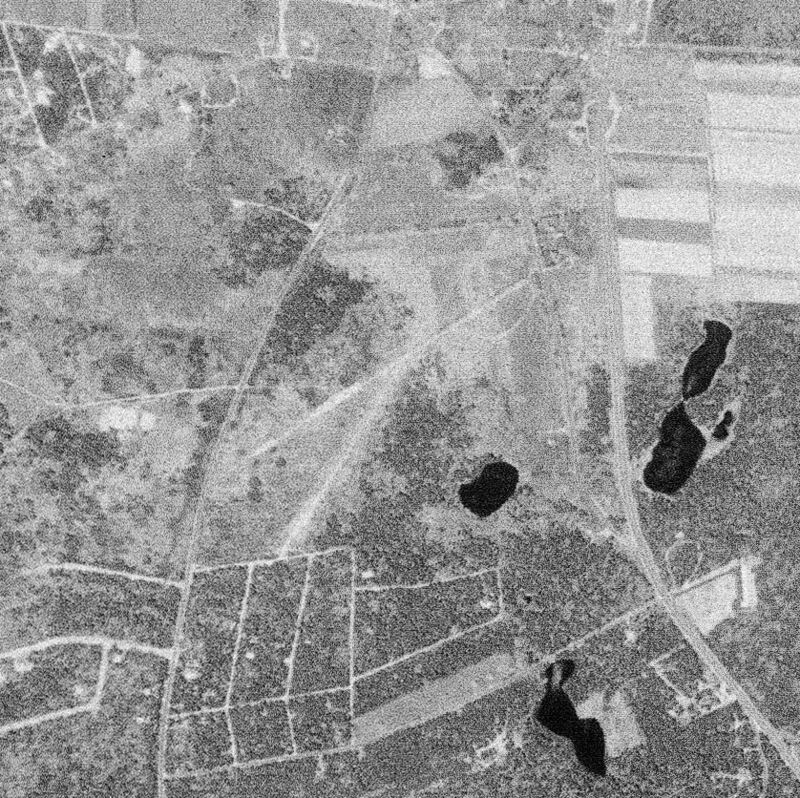 The earliest photo of North Middleboro which has been located was a 1960 aerial view. 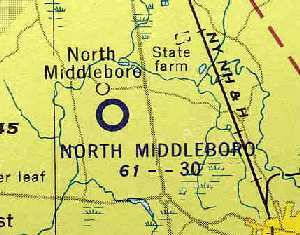 It depicted North Middleboro as having a single unpaved east/west runway. Three single-engine aircraft were parked around a small building on the southwest side. as having a 3,000' sod runway (9/27), and the operator was listed as C. Lewis. and described it as having a single 2,600' turf runway. on the 1968 Boston Sectional Chart (courtesy of Chris Kennedy). with a total of 22 light aircraft parked on either side of the west end of the runway..
was on the July 1975 Boston Terminal Aeronautical Chart (courtesy of Mitchell Hymowitz). It depicted Middleboro as having a 2,800' paved runway. 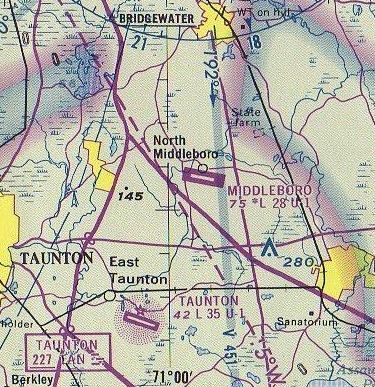 The 1977 USGS topo map depicted “Middleboro Airport” as having a single paved runway. and included the note: "swimming pool at field". The November 1983 Flight Guide (courtesy of Matt Elia) depicted Middleboro Airport as having a 2,850' paved Runway 11/29, with a ramp & 3 small buildings on the southwest side. 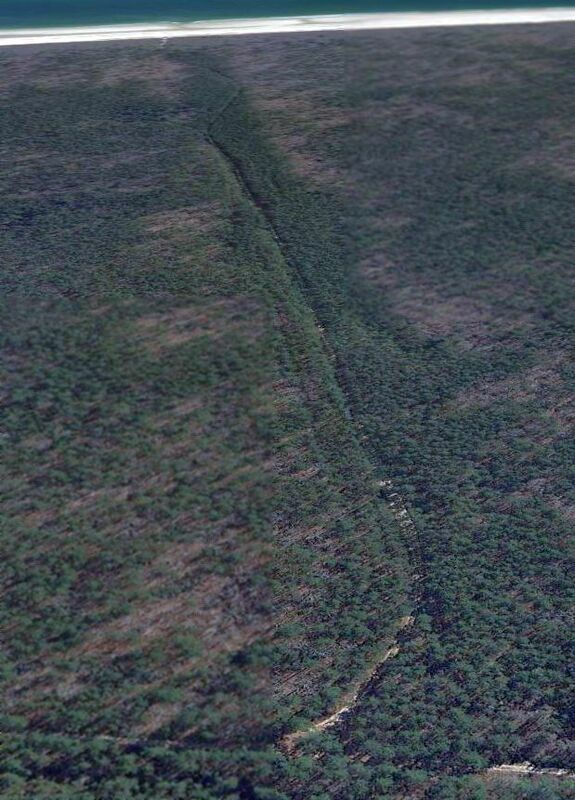 and it was depicted simply as "Landing Strip" on the 1994 USGS topo map. and several houses had been built. The eastern half of the runway remained relative undisturbed, including a closed-runway "X" plainly visible. 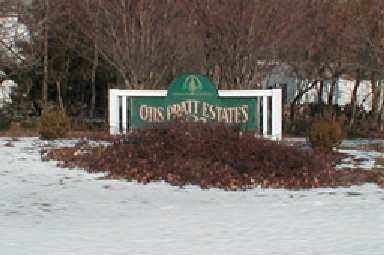 A 2002 photo by Jonathan Westerling of the entrance sign to Otis Pratt Estates, the site of the former airport. 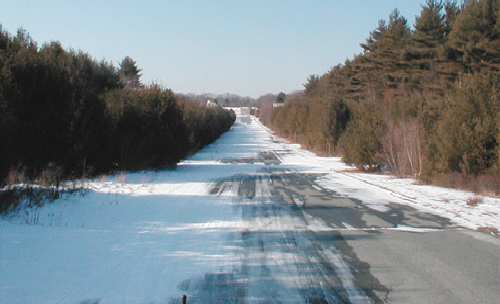 A 2002 photo by Jonathan Westerling looking east along the remaining length of the former runway at North Middleboro. while the remainder of the former runway had been reused as a driveway for the 2 houses built towards its eastern end. "It has been unaltered, and still has discernable yellow lines down the middle. I wonder if the homeowners need to announce their intentions over Unicom when they leave their garage?" 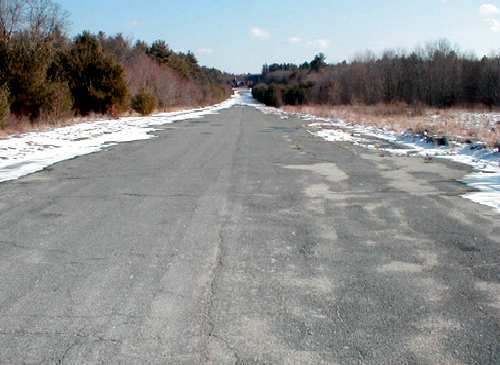 A 2002 photo by Jonathan Westerling looking west along the remaining length of the former runway at North Middleboro. A circa 2005 aerial photo looking north at the western end of the remaining runway at North Middleboro. A 2008 aerial view looking northwest along the former North Middleboro runway. Thanks to Peter Kodis for pointing out this airfield. A November 1947 aerial view looking north-northeast at the site of Fall River Municipal Airport. nor on the January 1946 Hudson River World Aeronautical Chart (according to Chris Kennedy). with a northeast/southwest clearing having been constructed for the eventual runway. 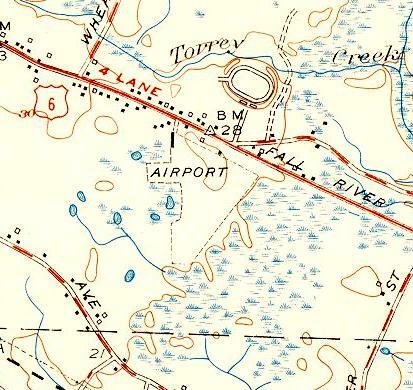 The earliest topo map depiction of Fall River Airport which has been located was on the 1951 USGS topo map. with a ramp & an airway beacon at the southwest corner of the field. was on the June 1953 Hudson River World Aeronautical Chart (according to Chris Kennedy). 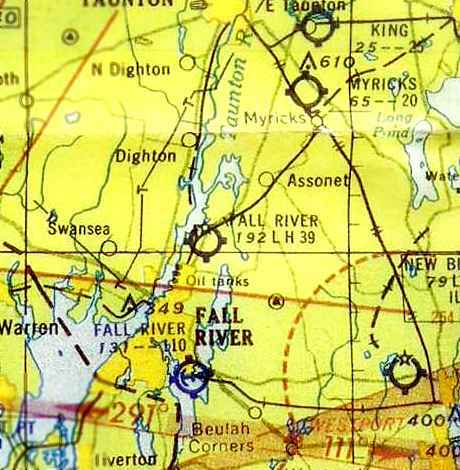 depicted Fall River as having a 3,900' hard surface runway. 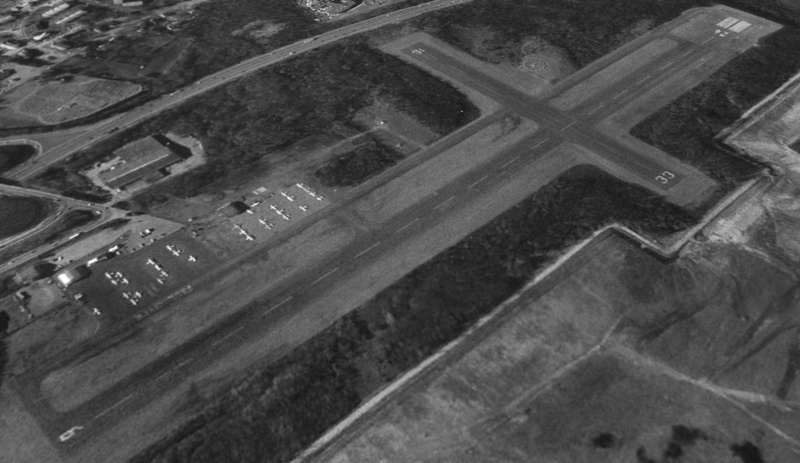 The earliest photo of Fall River Airport which has been located was a 1961 aerial view. with a ramp, a few small buildings, and 2 single-engine aircraft on the southwest corner of the field. and the operator listed as Naragansett Airways. described the field as having 2 runways, with the longest being a 3,950' bituminous concrete strip. 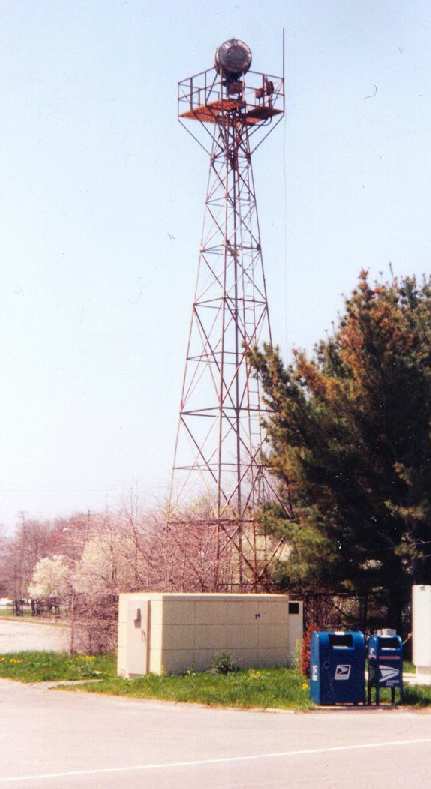 as well as the Fall River NDB beacon, located just west of the airport. A 1971 aerial view depicted a dozen light aircraft parked on the Fall River Airport ramp. The November 1983 Flight Guide (courtesy of Matt Elia) depicted Fall River as having a 2 paved runways, with an FBO & one other building on the west side. Steven Katz recalled, “Fall River Airport... I did some pilot training there in the mid-1980s & worked a few summers on the ramp driving the fuel truck, washing airplanes & various other gopher tasks. In the mid-1980s there where actually 2 Fixed-Base Operators on the field. The smaller of the 2 operated out of the building closer to the 24 end of the long runway. 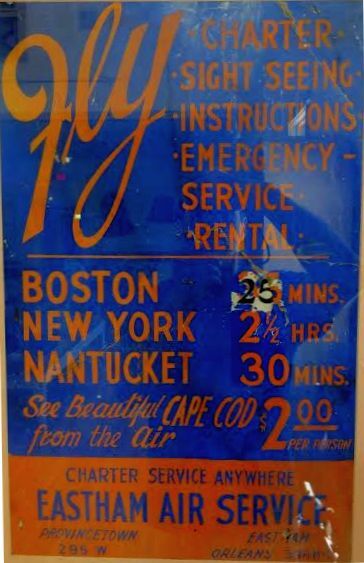 The larger operation was called Fall River Airways & was owned by 2 partners both of whom were also flight instructors. The daily management was done by one of the owner's brother. They occupied a trailer & a small building next to the main hangar just off the parking lot. 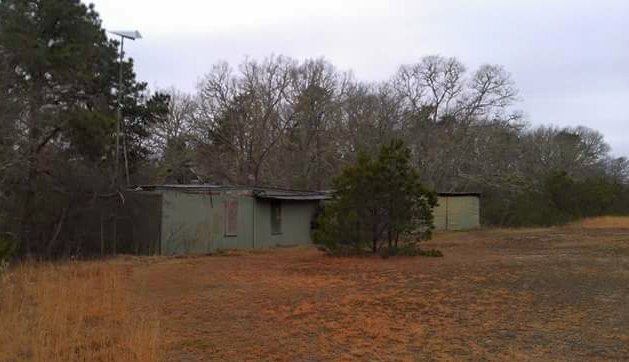 The small building was a pilots lounge for visitors & the local aircraft owners/pilots; the trailer was offices & classrooms. Fall River Airways was responsible for the VHF advisory, sold fuel (100LL & auto gas), and parked transients. A 1990 photo depicted several Cessnas at Fall River. 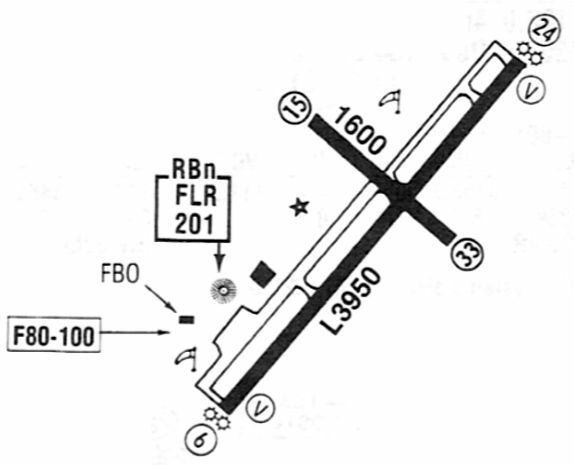 The 1993 Jeppesen Airport directory depicted Fall River as having 2 paved runways: 3,948' Runway 6/24 & 1,600' Runway 15/33. A parallel taxiway ran the length of Runway 6/24, and a paved ramp sat at the southwest end, with several hangars. The operator was listed as Naragansett Aircraft. with a total of 33 light aircraft visible parked on the ramp. because the city built a large landfill adjacent to the east side of the airfield. that the FAA deemed the airport unsafe for use. and the Fall River Airport would become an industrial park. It was closed at some point between 1995-98. An August 2000 photo by Steve Brazao of the rear of an abandoned Fall River Airport hangar. A December 2000 photo by Steve Brazao of the front of an abandoned Fall River Airport hangar. but it was basically nothing more than a double-wide trailer & a ramp. By 2000, I think those were gone. My grandfather was a lifetime FallRiver resident & often took us to the airport to watch the airplanes take off & land, so it was very sad to see the airfield go. 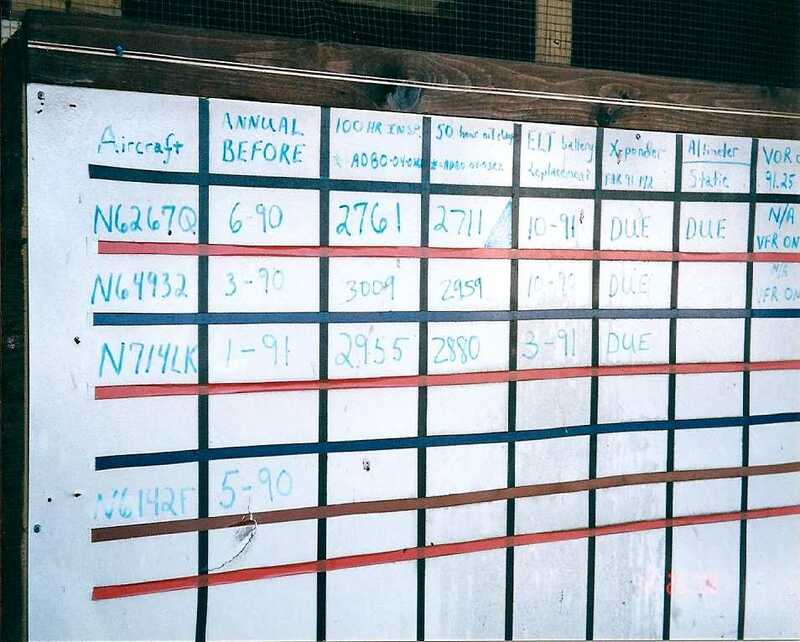 A December 2000 photo by Steve Brazao of a maintenance schedule board “in the small office attached to the hangar” at Fall River. with portions of the 2 runways still remaining intact on the eastern side, along with the VASI light system. 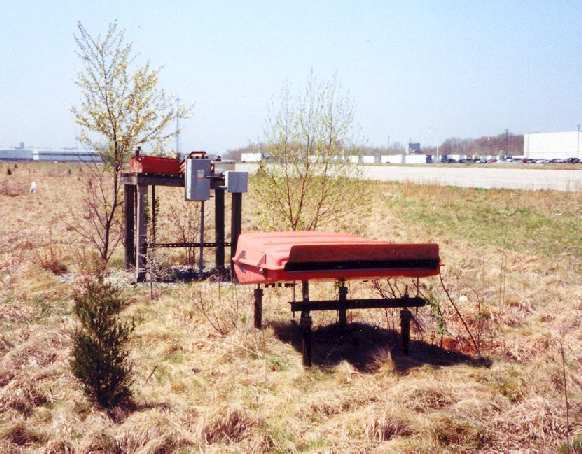 A Summer 2003 photo by Peter Kodis of the former airport beacon which remains standing at Fall River. A Summer 2003 photo by Peter Kodis of the Runway 24 VASI approach-slope guidance lighting which remains at Fall River. 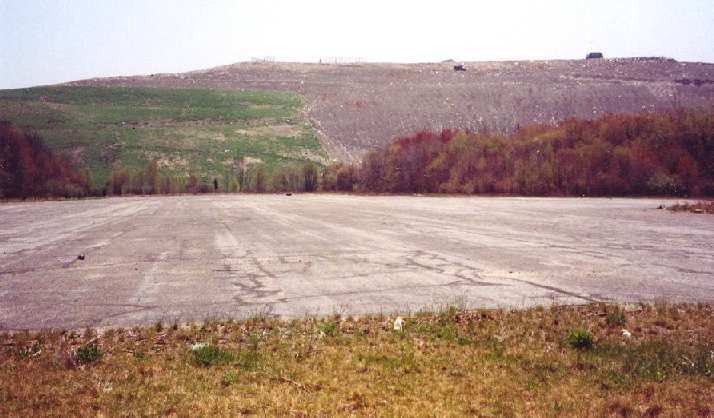 A 2003 photo by Peter Kodis of the remains of Runway 15, which now runs right into a massive landfill hill. 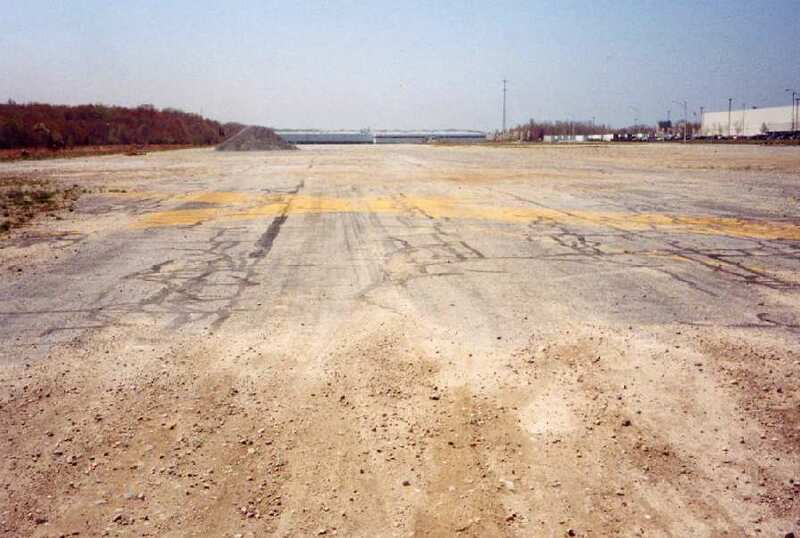 A Summer 2003 photo by Peter Kodis of the closed-runway "X" markings are still visible on the former Runway 24. 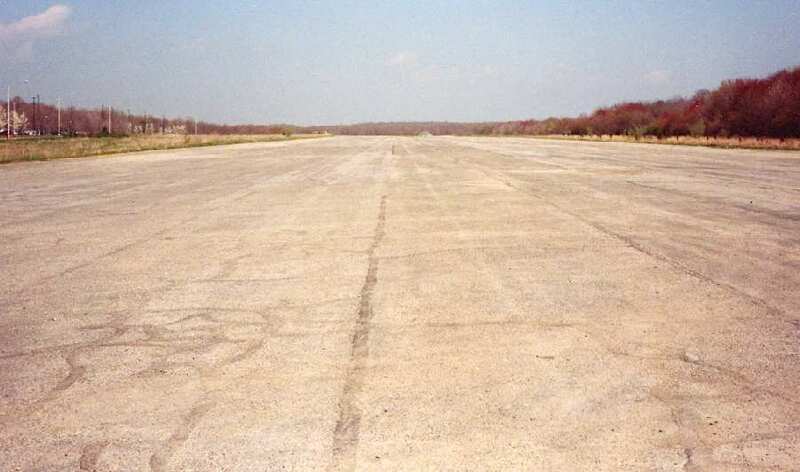 A 2003 photo by Peter Kodis looking north, the former Runway 6 still appears remarkably intact. 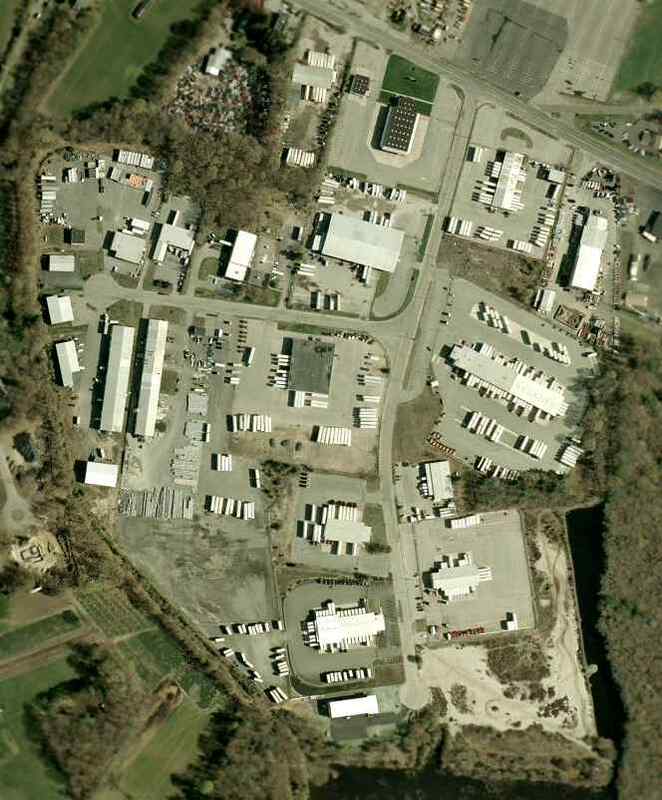 A circa 2006 aerial view looking east at the former Fall River airway beacon. A February 2009 aerial view by Dan Fields looking north at the remains of the 2 runways at Fall River. A 2014 photo by Doug Fortnam of the former Fall River Airport beacon, which still operates from a Dunkin Donuts parking lot. 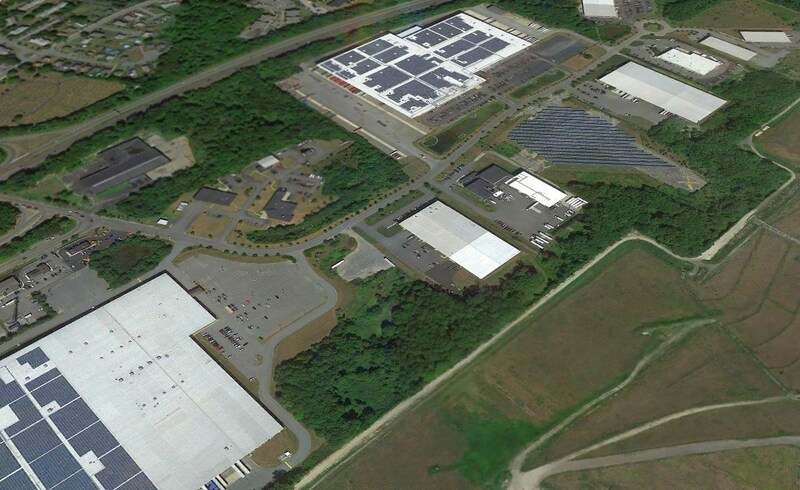 Doug reported, “The Fall River Industrial Park is built on the site of the Fall River Airport. 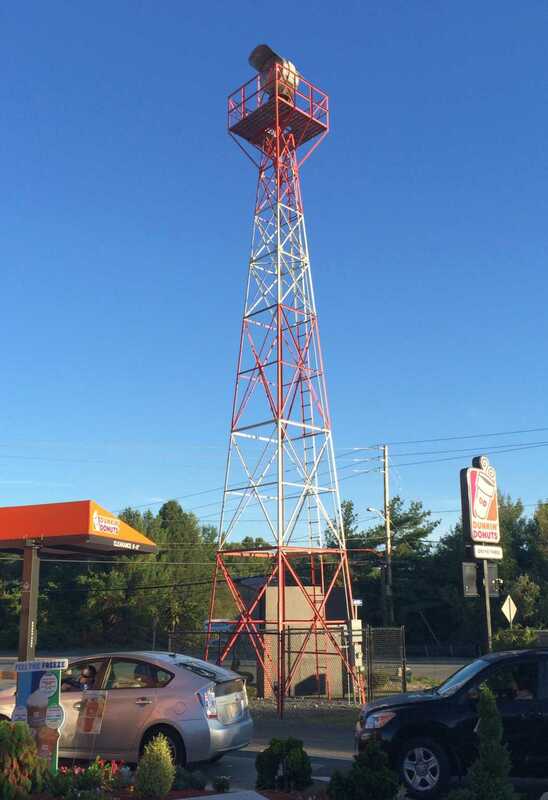 I was surprised to see that the old airport beacon is still there & it now resides in the Dunkin Donuts parking lot! A 4/12/15 aerial view by Graeme Smith looking east at the site of Fall River Airport. Graeme reported, “The entire area of the runways is now under the landfill or the Industrial Park to the south. The only small part of a runway [remaining is a portion of] Runway 15 [left of center]. The Airport beacon next to the Dunkin Donuts has recently been restored. but a close examination reveals portions of the pavement of Runways 6/24 (middle of photo) & 15/23 (top-right), including a yellow closed-runway “X” symbol still visible.